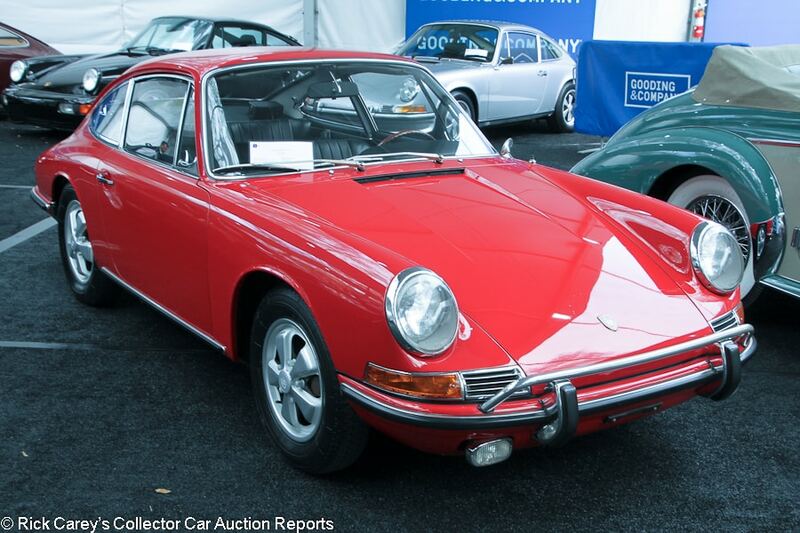 Of the 89 cars on the Friday docket at Gooding & Company’s auction at the Amelia Island Plantation 33 were Porsches (37.1% of the docket) including ten in the no reserve offering from the collection of WhatsApp founder Jan Koum. In common with its competition Gooding raised its Buyer’s Premium to 12% of the first $250,000, nudging the final results a scosch higher while making it financially realistic for Gooding to mix in a few moderately-priced cars. The Porsche-centric docket continues what has become a pattern for Gooding at Amelia Island. Last year there were 38 of 86 offered (44.2%). In 2017 it was 25 of 88 (28.4%) and in 2016, the Jerry Seinfeld year, 28 of 81 (34.6%) making Gooding’s Amelia auction look like the used car lot at Brumos in Jacksonville. This report regrettably misses some of the more diverse and interesting cars Gooding offered. Andrew Newton and Greg Ingold did a great job with the more recent lots. Rick Carey became fixated by the Brass and Antiques at Bonhams and didn’t spend enough time in the Gooding marquee at the Plantation, for which I apologize. The Packard 734 Speedster Runabout, Ferrari Lusso and 275 GTS and Kurtis Sports Car are wonderful cars that don’t deserve to be overlooked. Onsite observations are mostly by Andrew Newton and Greg Ingold; Rick Carey did the final edits and some of the Comments and is responsible for the final content. The reports are sorted by lot number. 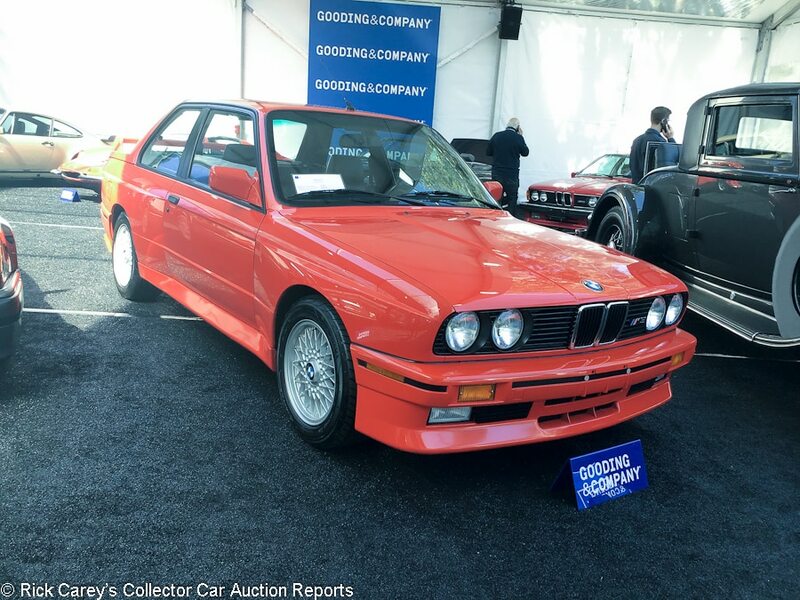 Lot # 8 1988 BMW M3 Coupe; S/N WBSAK0305J2195473; Henna Red/Black leather; Estimate $90,000 – $120,000; Unrestored original, 2- condition; No Reserve; Hammered Sold at $85,000 plus commission of 12.00%; Final Price $95,200. – Air conditioning, sunroof, includes books, tools, jack, and spare tire. – Previously owned by racer Graham Rahal and had a full service recently. The paint has some chips on the nose and scrapes under the front lip. The driver’s side quarter panel has a noticeable gouge. The underbody is clean but shows age and use commensurate with the 43,544 miles showing. The driver’s seat has minor creasing, although the rest of the interior is very good. Attractive and well kept, but nevertheless still a used E30 M3. – Even a used first gen E30 M3 is a properly expensive car these days and this result is more than a brand spanking new 2019 M3 or M4. Go figure. 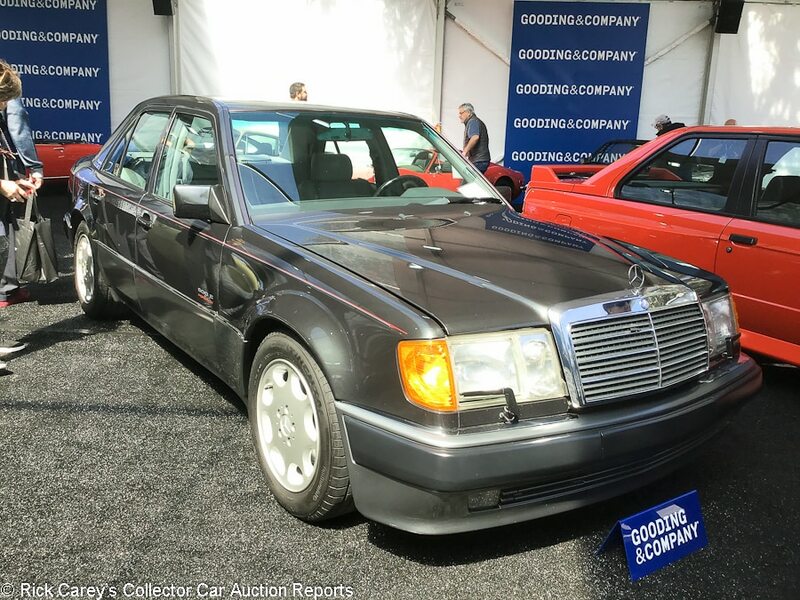 Lot # 12 1992 Mercedes-Benz 500E Sedan; S/N WDBEA36E8NB701595; Black Pearl, Grey lower cladding/Gray leather; Estimate $70,000 – $90,000; Unrestored original, 2- condition; No Reserve; Hammered Sold at $75,000 plus commission of 12.00%; Final Price $84,000. 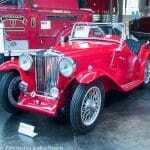 – 4973/322hp V8, automatic, air conditioning, sunroof, power windows and locks. – The paint has numerous stone chips directly beneath the headlights, but the rest of the paint is very good and does not show the same wear. The engine compartment has been kept very clean and shows minimal use commensurate with the 31,182 miles showing, and the underbody is very clean with no significant dirt or wear. The interior has no visible wear or deterioration. A sparingly used 500E that was maintained very well. – Built jointly with Porsche, the 500E was one of the fastest, mostly highly engineered sedans of its day, although it didn’t look much different from a standard W124 and even Mercedes-Benz fell under the spell of plastic lower body cladding. Mercedes sold the 500E in the States, but only about 1,500 made it here. Their performance cred and the Porsche connection has put them on the radar over the past year and the really good ones today command somewhere around their original 80 grand base price. Despite this one’s age, it brought a top-of-the-range result, indicating that demand is still very strong for these Stuttgart super-sedans. 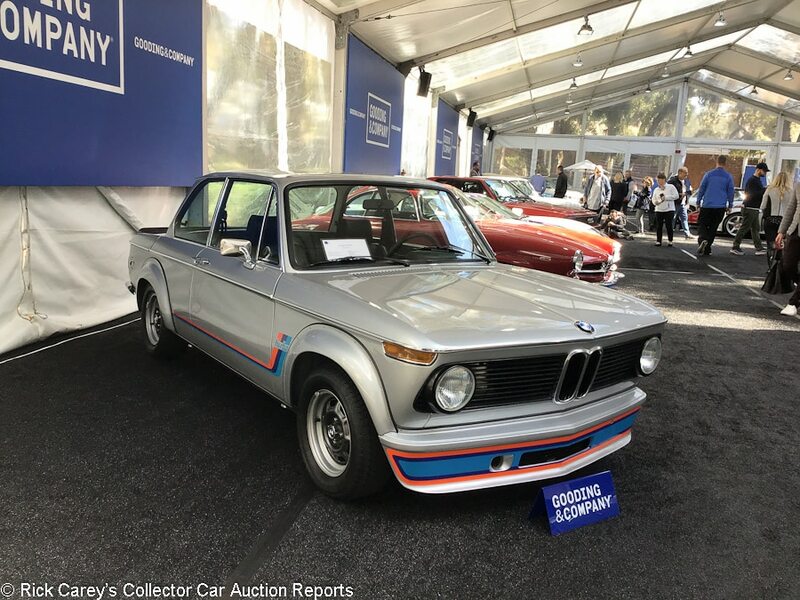 Lot # 16 1974 BMW 2002 Turbo Sedan; S/N 4290558; Polaris Silver/Black; Estimate $120,000 – $150,000; Recent restoration, 2+ condition; No Reserve; Hammered Sold at $100,000 plus commission of 12.00%; Final Price $112,000. – Original 5-Speed gearbox, Blaupunkt radio. – Originally owned by racer, Dieter Hegels, and includes BMW Classic Vehicle Certificate. Replacement engine. Excellent paint. The body panels are straight and the panel gaps are consistent. The underbody has been immaculately restored and the interior shows no use. A beautifully restored 2002 Turbo with nothing to nitpick condition-wise, although it must be noted that the engine isn’t represented as original. – Prices for 2002 Turbos have skyrocketed in recent years, with good ones fetching north of 150 grand. Gooding even sold one here last year for $192,500. This example is gorgeous and has absolutely nothing to apologize for other than its engine, so this much lower than market result just goes to show how much value serious collectors place on matching numbers. 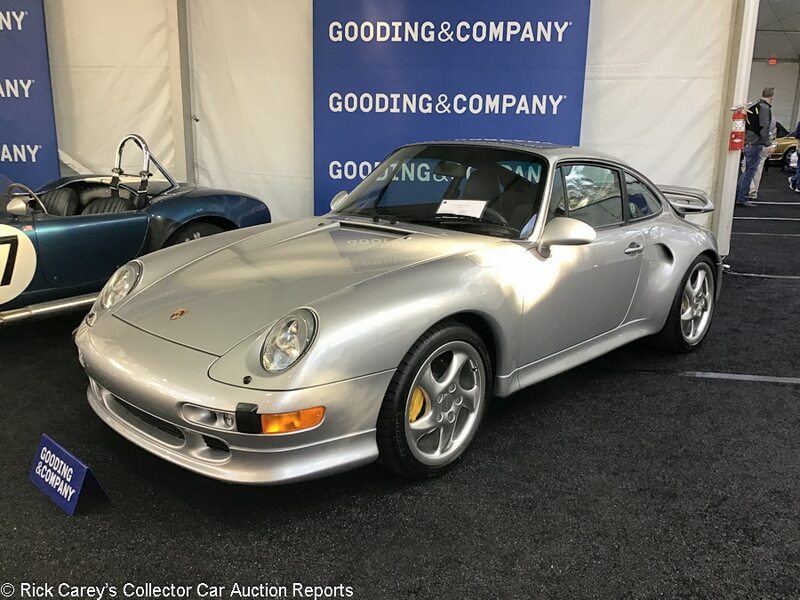 Lot # 18 1997 Porsche 911 Turbo S Coupe; S/N WP0AC299XVS375852; Arctic Silver Metallic/Black, Gray leather; Estimate $425,000 – $475,000; Unrestored original, 2 condition; With Reserve; Hammered Sold at $380,000 plus commission of 11.32%; Final Price $423,000. – 3601/424hp, twin turbo, 6-speed, Turbo Twist wheels, yellow calipers, air conditioning, sunroof, CD player. – Very good paint and body showing no significant blemishes. The underbody is very clean and has no deterioration. The interior is like new. An almost unused 993 Turbo S (one of only 176 imported to the U.S.), serviced 300 miles ago and showing just 11,318 miles total. – The 993 Turbo S is among the fastest and most desirable late air-cooled Porsches, and there were three on offer in Amelia this year. RM had two of them, and one was another Arctic Silver car with similar mileage to this one. The RM Turbo S brought a low $346,000, while this one brought a number much closer to what excellent Turbo Ss have been asking for the past couple of years, a full retail price even with the low miles. 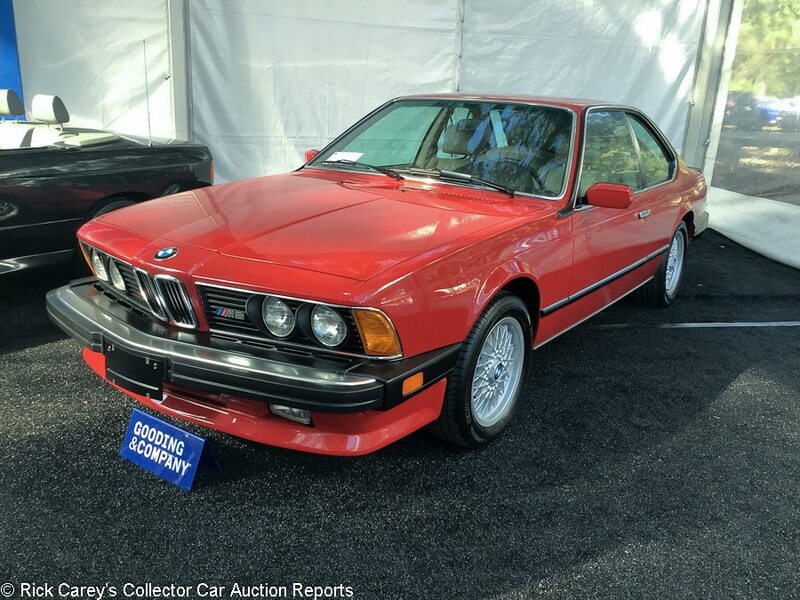 Lot # 19 1987 BMW M6 Coupe; S/N WBAEE140XH2560659; Red/Beige leather; Estimate $60,000 – $80,000; Unrestored original, 2 condition; No Reserve; Hammered Sold at $60,000 plus commission of 12.00%; Final Price $67,200. – 5-speed, air conditioning, sunroof, power seats, includes books, tools and service records. – Excellent, original paint with no significant deterioration or aging. The underbody is immaculate. The interior has no noticeable wear and looks like new. A wonderfully preserved M6, showing just 37,961 miles and pampered the whole way. – While the M6 of the 1980s cost considerably more than the equivalent M3 when new, the M6 is actually worth less today. That doesn’t make it cheap, though, and this fair price is what it takes to get into the very best shark-nose Bimmers these days. Lot # 23 1991 BMW M3 Cabriolet; S/N WBSBB05080EB86431; Grey/Grey leather; Estimate $70,000 – $90,000; Unrestored original, 2- condition; No Reserve; Hammered Sold at $82,500 plus commission of 12.00%; Final Price $92,400. – 2302/215hp, 5-speed, alloy wheels, original tools and books. – The paint has no significant damage from use, and the underbody is extremely clean and well maintained. The driver’s seat has a few creases from use, otherwise the interior is not excessively worn. A very good German-delivered example that looks like it should have fewer than the 35,850 km showing. – The cabriolet version of the famous E30 M3 was never officially sold in the United States and it is a very rare car worldwide, with less than 800 built. Even so, there isn’t anything else special about them other than the roof going down. 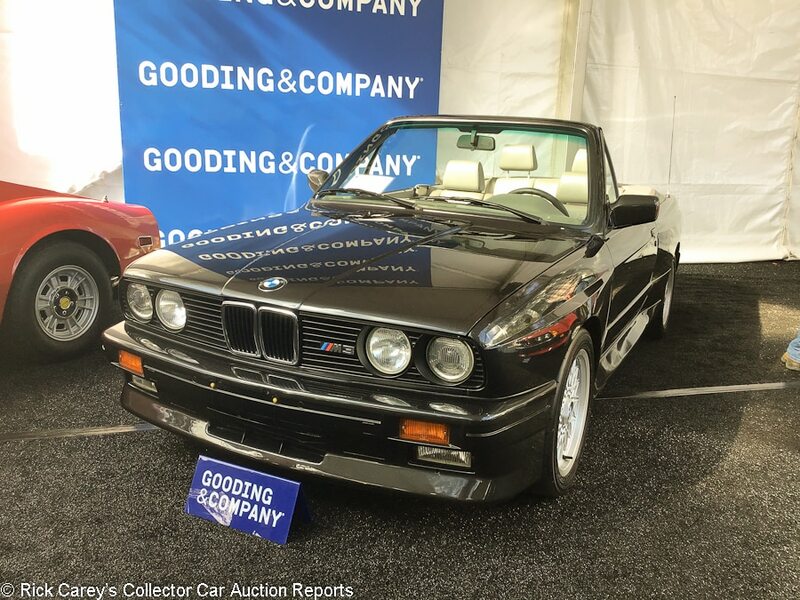 Serious buyers and collectors are enamored with the race-bred fixed roof coupes, so despite the rarity, condition and open-air motoring offered by this M3 cab, it defied the old adage that ‘when the top goes down, the price goes up.’ It sold for about the same amount a coupe in this condition would. 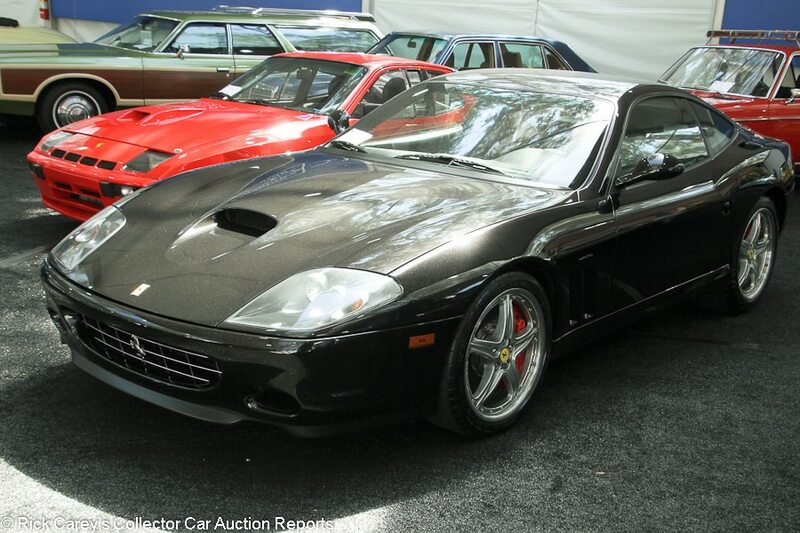 Lot # 32 2005 Ferrari Superamerica Convertible; S/N ZFFGT61A350145381; Black/Black leather, Red bars; Estimate $325,000 – $375,000; Unrestored original, 2 condition; No Reserve; Hammered Sold at $250,000 plus commission of 12.00%; Final Price $280,000. – BBS modular wheels, Potenza tires, Daytona-style seats, Handling GTC package, paddle shift, SF shields, Yellow calipers, carbon ceramic brakes, books and tools. 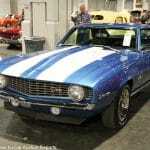 – Rare Superamerica model with 9,073 miles and a full service history. One of 170 for the US market. Very good paint, clean wheels, and the driver’s seat looks like it’s only been sat in a handful of times. Essentially like new, as you’d expect from a late model limited-production Ferrari. The only thing that would make it more desirable is a 6-speed, as only about 10 percent of the US market Superamericas got one. Belt serviced about 300 miles, but three years, ago. – Based on the 575, the Superamerica cost over 300 grand when it was new and limited-production Ferraris are essentially guaranteed to be collectible in the long-term, so this result for a good example was surprisingly modest. 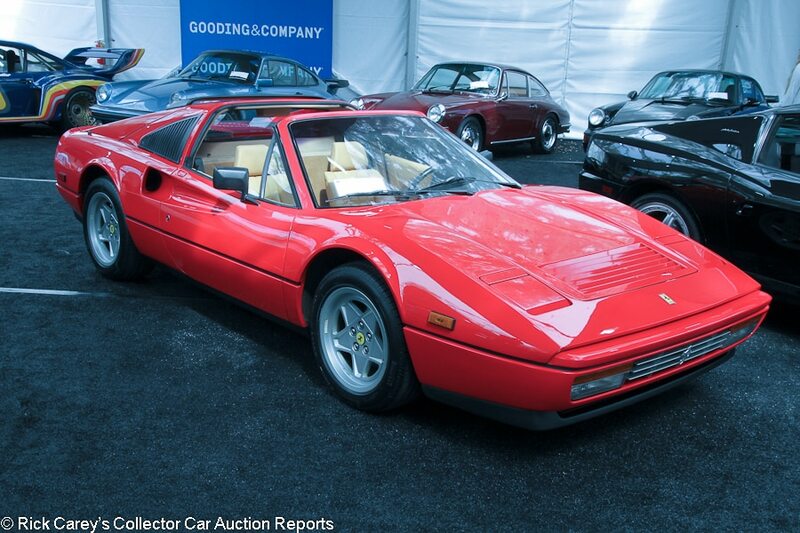 Lot # 34 1987 Ferrari 328 GTS Spider, Body by Pininfarina; S/N ZFFXA20A5H0071899; Rosso Corsa, Black roof panel/Tan leather; Estimate $90,000 – $120,000; Unrestored original, 2- condition; No Reserve; Hammered Sold at $67,500 plus commission of 12.00%; Final Price $75,600. – P Zero tires, cassette stereo, books, tools, jack. – Belt service just two months ago and showing 19,958 believable miles. Fantastic paint. A few tiny scrapes on the wheels. The rubber on the top of the windshield and roll bar is a little dry. Light but visible wear on the seats. A mostly very good 328 in classic colors, but a little used. – The 308 and 328 fell out of favor a bit recently as some of the attention turns to later V8 Ferraris, but prices for good ones are still relatively strong, and this was a spot-on result. 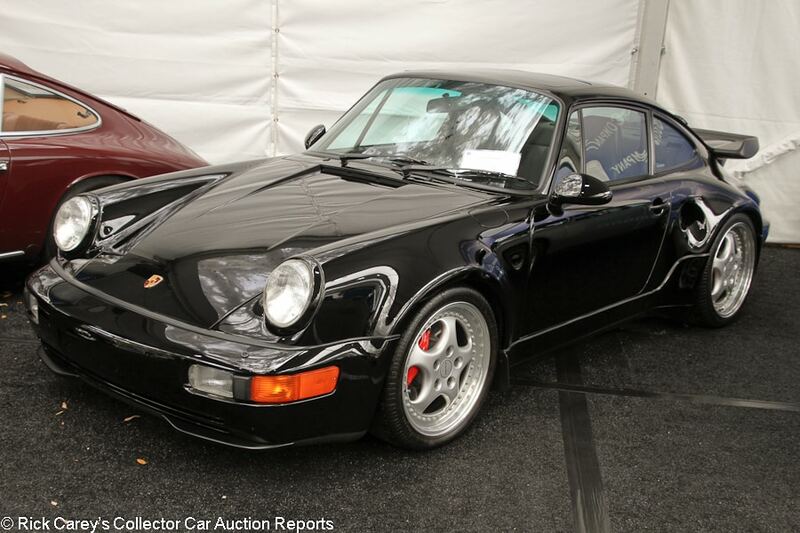 Lot # 36 1994 Porsche 911 Carrera Turbo Coupe; S/N WP0AC2962RS480445; Black/Black leather; Estimate $250,000 – $325,000; Unrestored original, 2- condition; No Reserve; Hammered Sold at $235,000 plus commission of 12.00%; Final Price $263,200. – 3601/355hp, 5-speed, air conditioning, Speedline wheels with Pirelli P Zero tires, sunroof, CD player. Includes books and tools. – The paint is in excellent condition, the engine and underbody show little deterioration from use, and the interior is nearly like new. A gorgeous 3.6 Turbo that has not been driven significantly and looks like it should have even fewer than the 23,158 miles showing. 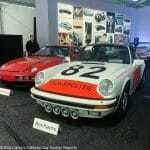 – It was Porsche-galore in Amelia Island this year, and there were 20 collectible 911s at Gooding alone. It could have been easy for this very good but not exceptional 964 Turbo to fly under the radar at no reserve, but luckily for the seller it brought a spot-on, appropriate result that both parties can be happy with. 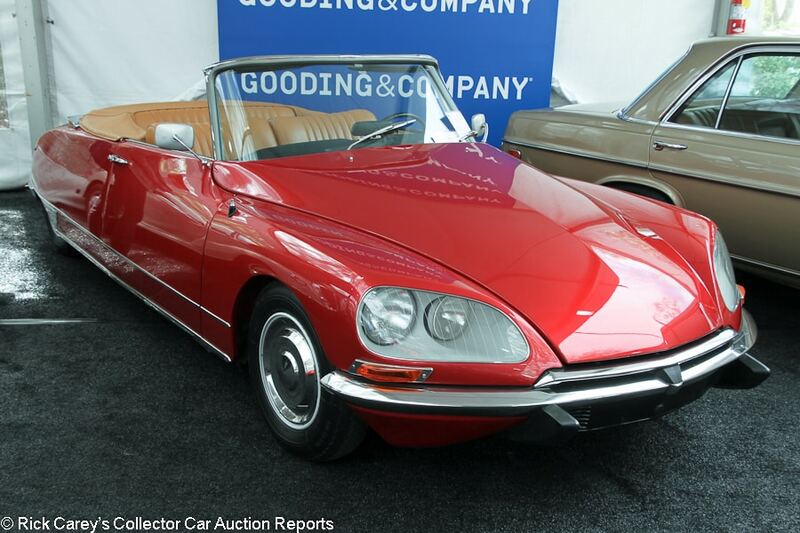 Lot # 37 1970 Citroen DS21 Cabriolet, Body by Chapron; S/N 00FA0662; Engine # 458000706; Red/Tan leather; Tan cloth top; Estimate $300,000 – $400,000; Older restoration, 2- condition; With Reserve; Hammered Sold at $235,000 plus commission of 12.00%; Final Price $263,200. – Michelin XAS tires, wheel covers, dual mirrors, boot cover, Autovox radio, column shift automatic, fuel injection. – The paint is bright, but there are blisters on the hood, touch ups behind the door edges, and orange peel on the trunk. The seats are lightly wrinkled but presentable, and some of the switchgear is lightly worn. Very clean underneath. The Chapron-bodied DS is delightfully funky in any condition, and this one is reasonably well restored, but it has a few too many flaws to be a stunner. – Back in the early 90’s this decapotable was offered twice at auction before its restoration. At the Charleston auction in Toronto in August 1991 it was bid to $34,400 and at the Kruse Miami auction in January 1993 it was bid to $32,000, neither time changing hands. It’s had a comprehensive restoration since then and brought a strong price here considering the restoration’s age and noted flaws. 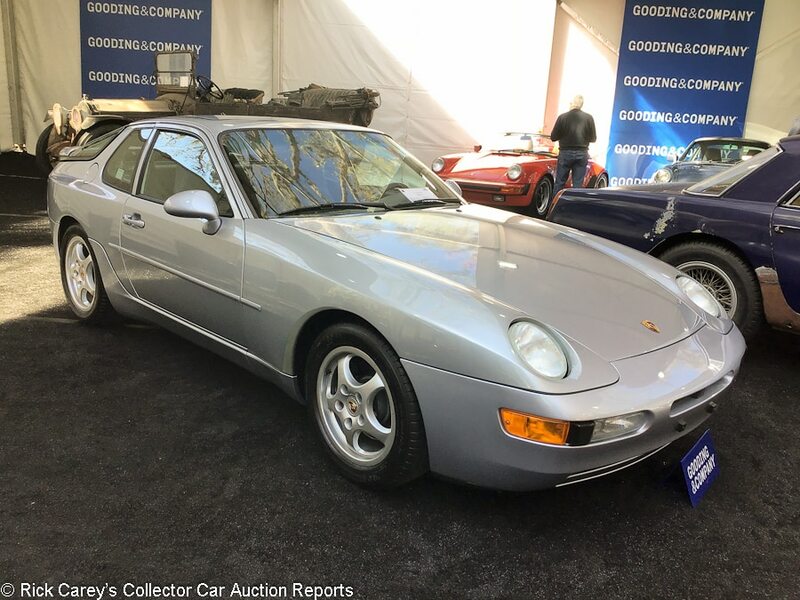 Lot # 38 1995 Porsche 968 Coupe; S/N WP0AA296XSS820310; Polar Silver Metallic/Gray leather; Estimate $40,000 – $60,000; Unrestored original, 2- condition; No Reserve; Hammered Sold at $36,000 plus commission of 12.00%; Final Price $40,320. – Tiptronic transmission, power windows and locks, CD player. Previously owned by Bob Carlson, head publicist for Porsche. From the Brumos collection. – There are few minor chips on the nose, but otherwise the paint is excellent. The underbody is very clean and shows minimal deterioration. The interior shows minimal wear. Just 14,565 miles and nearly like-new but not quite. – The 968 is the best, prettiest, most developed and rarest of the four-cylinder transaxle Porsches that started with the 924 in the 1970s and the 944 in the ’80s. They are not at all a common sight at auction, and if this very high price is any indication, the bidders completely ignored this example’s Tiptronic and mundane paint color. The seller should be thrilled. 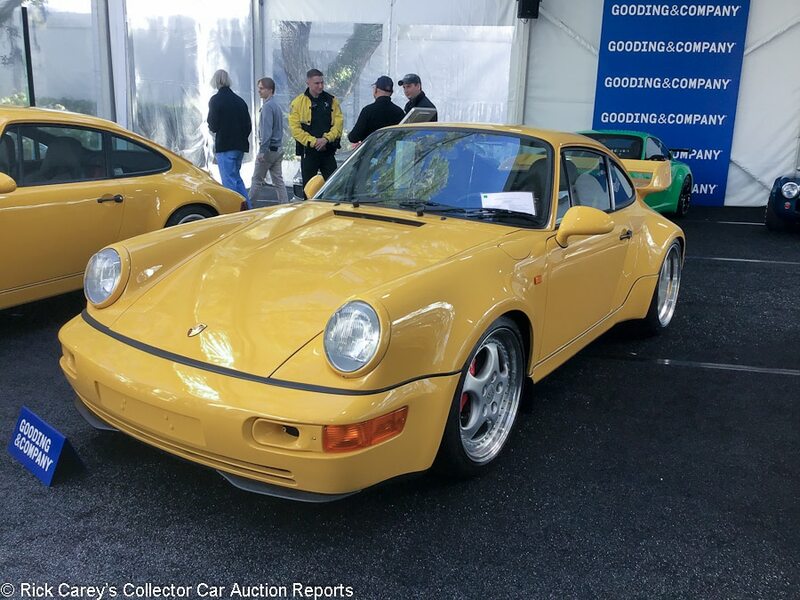 Lot # 41 1992 Porsche 911 Carrera RS Coupe; S/N WP0ZZZ96ZNS491789; Engine # 62N82625; Blossom Yellow/Black, Gray leather; Estimate $425,000 – $475,000; Unrestored original, 2- condition; No Reserve; Hammered Sold at $350,000 plus commission of 11.43%; Final Price $390,000. – Michelin Pilot Sport tires, Becker Avus radio, lightweight trim with no A/C and manual windows. Includes books, tools and Porsche Certificate of Authenticity. From the Jan Koum collection. – Delivered new in Italy. The paint is excellent and the engine and underbody show some use, but nothing excessive. The interior is very good and only the driver’s seat has minor stretching from use. A well-kept Carrera RS with 24,741 km and finished in a highly desirable color. – A fair balance of lightweight specs and rare color with the low but significant mileage. The lightweight specs and the color count for a lot, though, as other Carrera RSs in similar condition have brought under 300 grand recently. 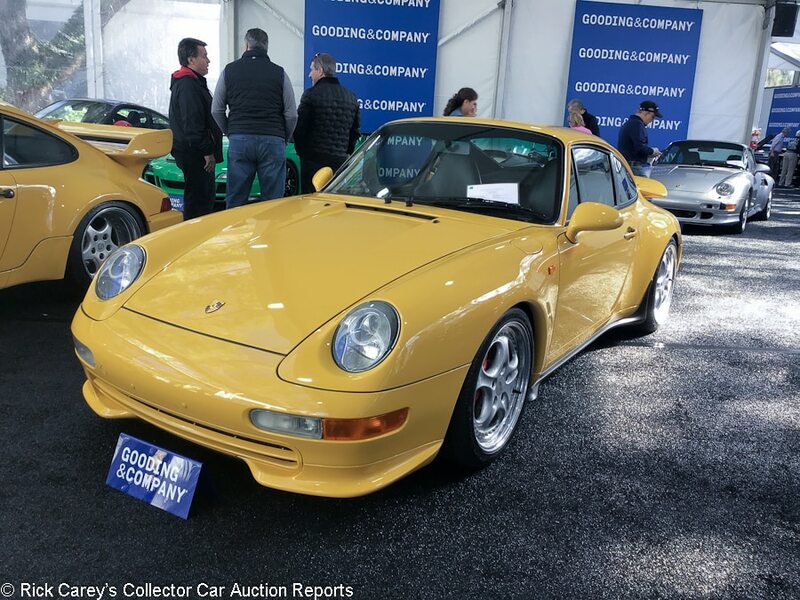 Lot # 42 1993 Porsche 911 Carrera RS 3.8 Coupe; S/N WP0ZZZ96ZPS497078; Engine # 62P85598; Speed Yellow/Black, Gray leather; Estimate $1,200,000 – $1,500,000; Unrestored original, 2 condition; No Reserve; Hammered Sold at $1,025,000 plus commission of 10.49%; Final Price $1,132,500. – Speedline wheels with Michelin Pilot Super Sport tires, radio delete, locking diff. Includes books, tools, Porsche Certificate of Authenticity and numbered 3.8 RS book. From the Jan Koum collection. – One of 12 finished in Speed Yellow. Sold new in Japan. The paint is very good, and only the nose has a few chips and blemishes from use. The engine and underbody have minimal age. The interior is very good with only some stretching to the driver’s seat. A well-kept, sparingly used example of one of the most desirable 964-generation 911s. – Just 55 of these cars were built. RM sold another Speed Yellow car here last year in similar condition for $1.655M, but it had less than 7,000 km, which shows just how much of a difference mileage can make in this hobby. 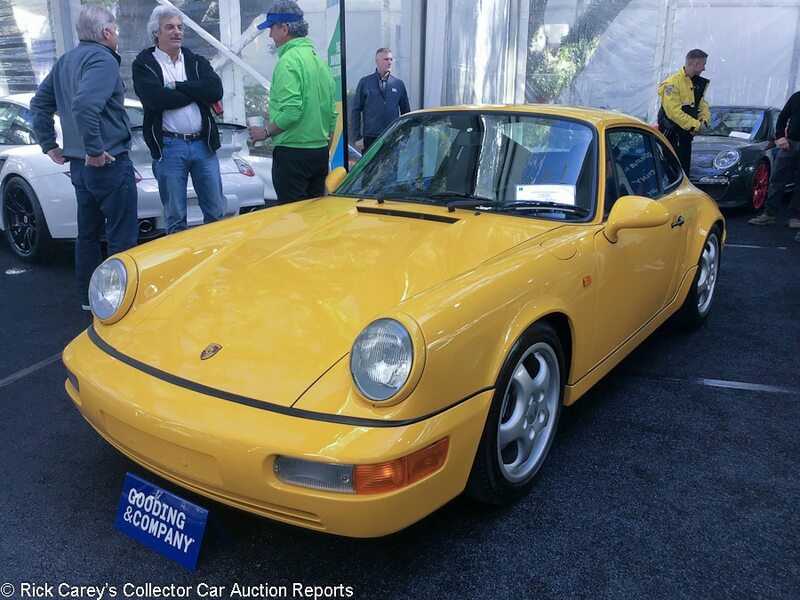 Lot # 43 1995 Porsche 911 Carrera RS Coupe; S/N WP0ZZZ99ZTS390074; Engine # 63S85666; Speed Yellow/Black leather; Estimate $325,000 – $375,000; Unrestored original, 2- condition; No Reserve; Hammered Sold at $270,000 plus commission of 11.85%; Final Price $302,000. – Air conditioning, Speedline wheels with Pirelli P Zero tires, red calipers, stainless exhaust tips, chromed instrument bezels, Blaupunkt radio. German delivery car, includes books, tools and documentation. From the Jan Koum collection. – Very good paint with a few stone chips to the nose. The engine shows some use but the underbody is very clean. The driver’s seat has some minor wear. Showing 54,590 km so it’s one of those seldom-seen high-performance 911s that somebody actually enjoyed, but it has clearly been consistently maintained and well cared for. – Several 993 Carrera RSs have sold for plenty more than this fairly modest result, and the relatively high odometer reading here trumped the solid condition and desirable color. 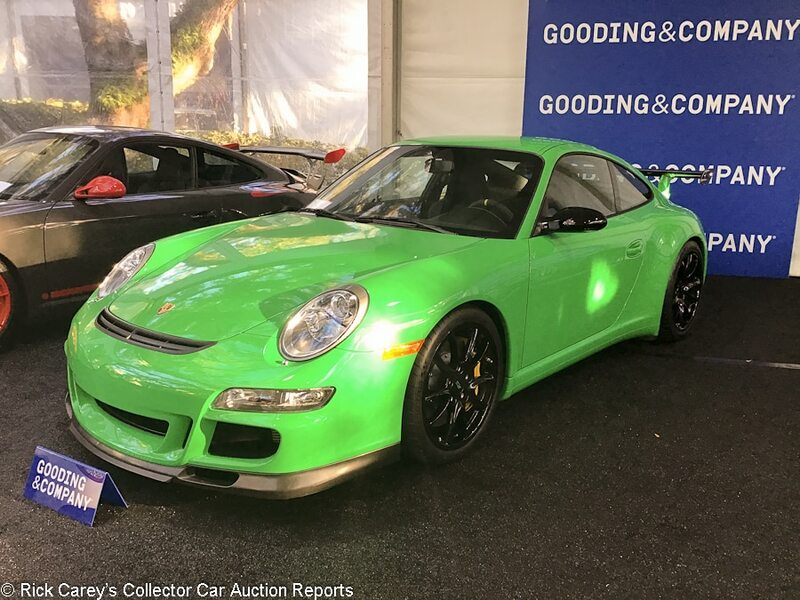 Lot # 44 2008 Porsche 911 GT3 RS Coupe; S/N WP0AC29998S792268; RS Green/Black; Estimate $250,000 – $300,000; Unrestored original, 2 condition; No Reserve; Hammered Sold at $160,000 plus commission of 12.00%; Final Price $179,200. – Carbon ceramic brakes, carbon fiber trim, Chrono Package Plus, PCM with navigation. Includes books and window sticker. From the Jan Koum collection. – No wear shown inside or out. A very well maintained example represented with 12,500 miles but looks like it should have far fewer. – According to Gooding, the various options on this car brought the base price up to $156,820. Counting for inflation, that’s more than the price it brought here, but given its rare specs, desirable color and low mileage, the value is likely to go up if subsequent owners take care of it. 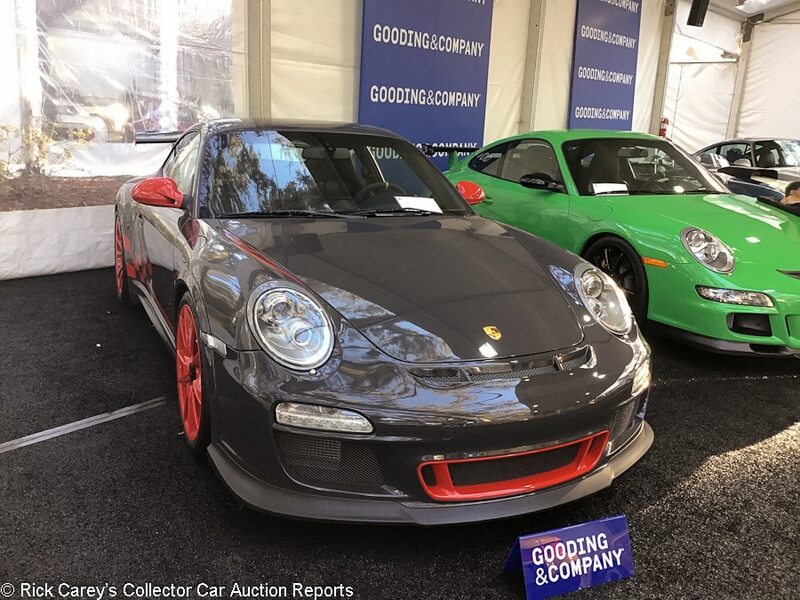 Lot # 45 2010 Porsche 911 GT3 RS Coupe; S/N WP0AC2A95AS783763; Gray Black, Guards Red graphics/Black; Estimate $180,000 – $220,000; Unrestored original, 2+ condition; No Reserve; Hammered Sold at $170,000 plus commission of 12.00%; Final Price $190,400. – Air conditioning, carbon ceramic brakes with yellow calipers, red wheels, front axle lift system, Sport Chrono Package Plus, carbon package, PCM with navigation, incudes books and tools. From the Jan Koum collection. – No signs of use inside and out. Essentially still in like new condition with 5,500 miles. – In 2010, the GT3 RS cost about 20 grand more than a standard GT3, but it got you 15 more horsepower and lighter weight. Long-term collectability looks good, as it does for most limited-production high-performance 911s. This is a fair result today and the car never really depreciated. It’s likely to only get more expensive in the future. 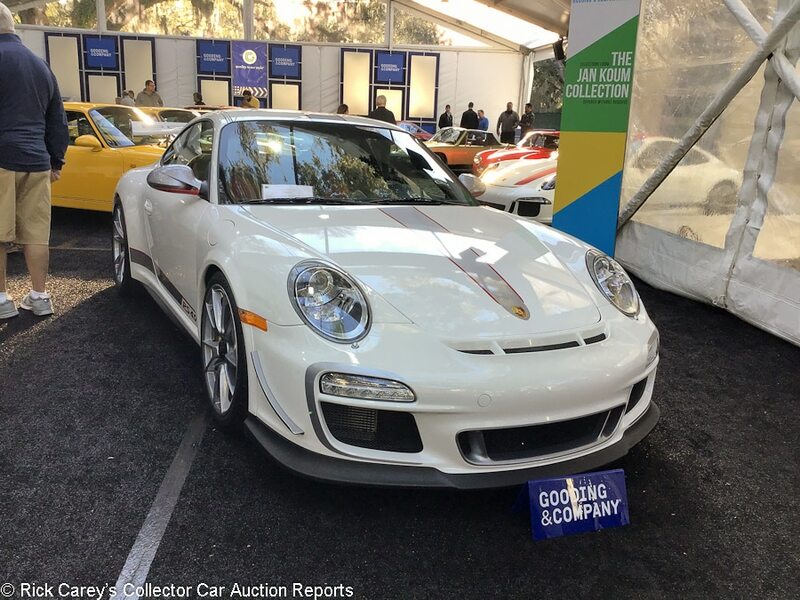 Lot # 46 2011 Porsche 911 GT3 RS 4.0 Coupe; S/N WP0AF2A99BS785718; Carrera White, Silver stripe/Red, Black; Estimate $550,000 – $625,000; Unrestored original, 2 condition; No Reserve; Hammered Sold at $525,000 plus commission of 10.95%; Final Price $582,500. – Carbon ceramic brakes with yellow calipers, Sport Chrono Package Plus, PCM with navigation, adaptive sports seats, includes books and manuals. From the Jan Koum collection. – Like new condition inside and out with just 160 miles. – It’s still essentially new, but when it was actually new, the options brought the price to $203,595, according to Gooding & Company. This is the final development of the 997 GT3 and it featured the largest engine fitted to a production 911. That distinguishes it from earlier GT3s, and at least partly explains the giant leap over its original price in just a few short years. The three-digit odometer reading also helped in a big way. 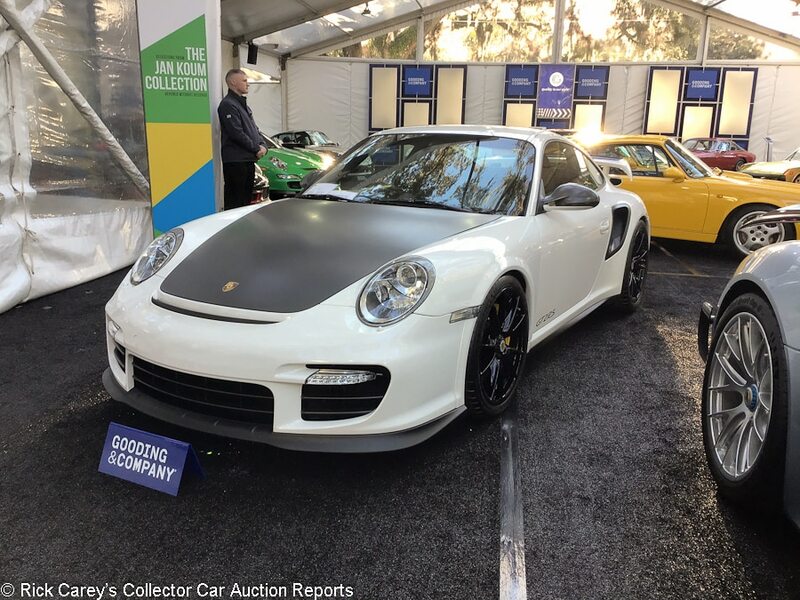 Lot # 47 2011 Porsche 911 GT2 RS Coupe; S/N WP0AE2A93BS778105; Carrera White, Carbon fiber hood/Black; Estimate $550,000 – $650,000; Unrestored original, 2 condition; No Reserve; Hammered Sold at $400,000 plus commission of 11.25%; Final Price $445,000. – Carbon ceramic brakes with yellow calipers, black alloy wheels, carbon front fenders, carbon fiber trim, PCM with navigation, lightweight battery, includes books and tools. From the Jan Koum collection. – Barely used and like new inside and out with 449 miles. – One of just 142 sold in the U.S. and represented as one of just 16 with the carbon fiber front fenders, which helped bring the original price to $272,740, according to Gooding. Yet another limited-production, high-performance 911 with no miles to shoot way up in value in only a short time, but for this GT2 RS to sell for so much less than the GT3 RS that crossed the block immediately before it is strange. 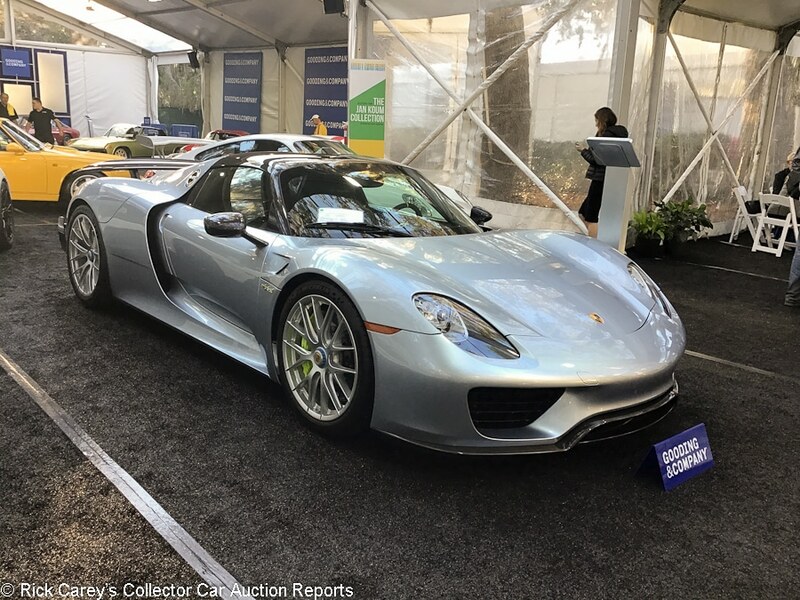 Lot # 48 2015 Porsche 918 Spyder Weissach Roadster; S/N WP0CA2A12FS800292; Liquid Metal Chrome Blue/Onyx Black leather; Estimate $1,800,000 – $2,000,000; Unrestored original, 2+ condition; No Reserve; Hammered Sold at $1,350,000 plus commission of 10.37%; Final Price $1,490,000. – From the Jan Koum collection. – Bought new by Koum. Hardly used and like new inside and out with 40 miles. – A 918 with the Weissach Package, which added more carbon fiber and lightened the windshield frame, windshield, roof, mirrors and wheels can command about $100,000 more than a standard 918 today. This is a spot-on number for a non-Weissach car, but for this Weissach-spec car it’s fairly modest. 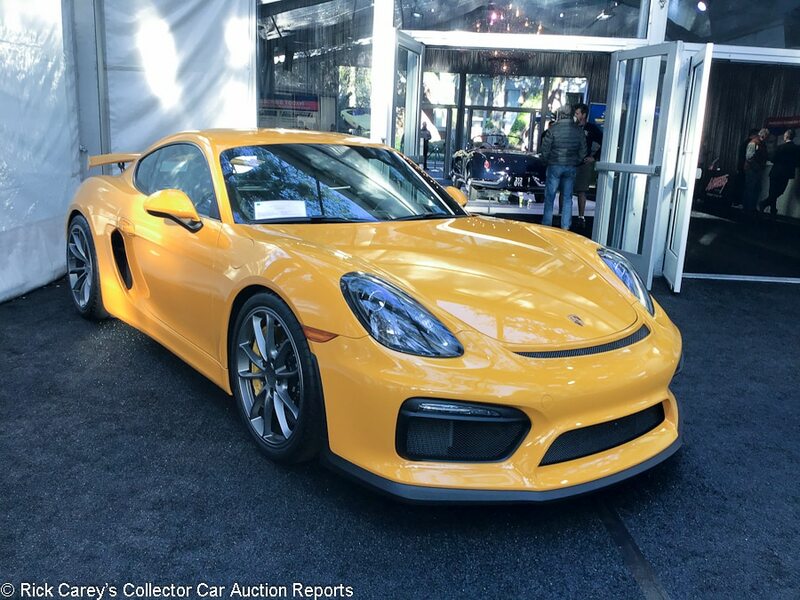 Lot # 49 2016 Porsche Cayman GT4 Coupe; S/N WP0AC2A85GK191909; Signal Yellow/Black leather; Estimate $140,000 – $180,000; Unrestored original, 2 condition; No Reserve; Hammered Sold at $105,000 plus commission of 12.00%; Final Price $117,600. – Carbon ceramic brakes with yellow calipers, paint to sample color, 16.9-gallon fuel tank, lightweight battery, Sport Chrono, fire extinguisher, radio and air conditioning delete. Includes books, tools and window sticker. From the Jan Koum collection. – Like new inside and out, and essentially a new 500-mile Porsche – The Cayman GT4 is one of the best driver’s cars that Porsche has built to date, but this one has seen essentially no enjoyment. These never really depreciated and for the most part have commanded prices around their MSRP since they started hitting the second-hand market. That said, this result was on the modest side given its options and color, but most of the bidders at the Omni were probably on the hunt for 911s, not lower-tier models like the Cayman. 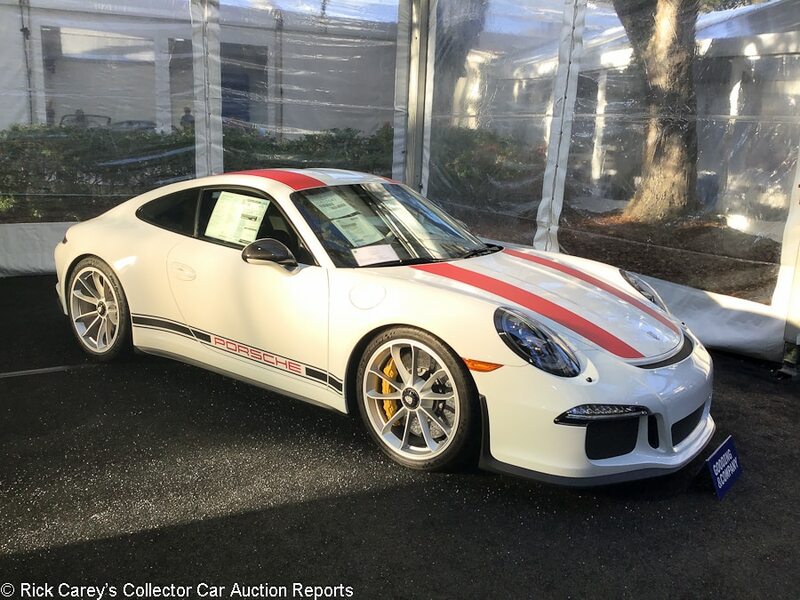 Lot # 50 2016 Porsche 911R Coupe; S/N WP0AF2A92GS195285; White, Red stripes/Black leather with houndstooth cloth inserts; Estimate $350,000 – $450,000; Unrestored original, 2 condition; No Reserve; Hammered Sold at $280,000 plus commission of 11.79%; Final Price $313,000. – Carbon ceramic brakes, Sport Chrono package, single-mass flywheel, 23.9-gallon fuel tank, fire extinguisher, includes window stickers. From the Jan Koum collection. – A completely factory fresh car still in the wrapper. It doesn’t come closer to showroom new than this. – A limited-production, high-performance model that sold out immediately, the 911 R had all the ingredients of an instant collectible and prices climbed quickly as a result. But when Porsche introduced the GT3 Touring Package on the 911, buyers realized they could essentially have a 911 R on a budget and with only about 100 lbs of extra weight. Prices for the real thing dropped down back to more realistic levels as a result, and the price for this one is in line with what other ones have brought recently. 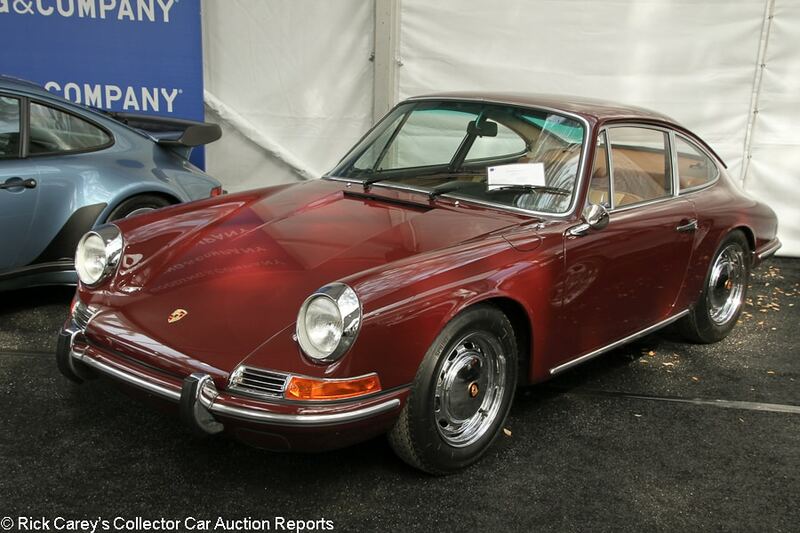 Lot # 51 1968 Porsche 911L 2.0 Coupe; S/N 11810504; Engine # 3180254; Burgundy Red/Brown leatherette; Estimate $140,000 – $180,000; Recent restoration, 2 condition; No Reserve; Hammered Sold at $75,000 plus commission of 12.00%; Final Price $84,000. – Chrome wheels, Vredestein tires, Sportomatic, Blaupunkt pushbutton radio, gold brightwork, CoA. – Matching numbers rare US-market L model with the even rarer Sportomatic, plus interesting colors and interior. Small scratch behind the right front bumperette but otherwise very good paint and chrome. Very clean and relatively fresh engine bay and underbody. Excellent restored interior. Well restored and rare configuration. – Not cheap, but certainly modest and fairly discounted for the rare but less desirable Sportomatic. Not all the Porsches in Amelia this year sold strongly, and a lot of the money at Gooding went to chasing newer high-performance 911s leaving the usually popular early 911s in the shadows, as this result indicates. 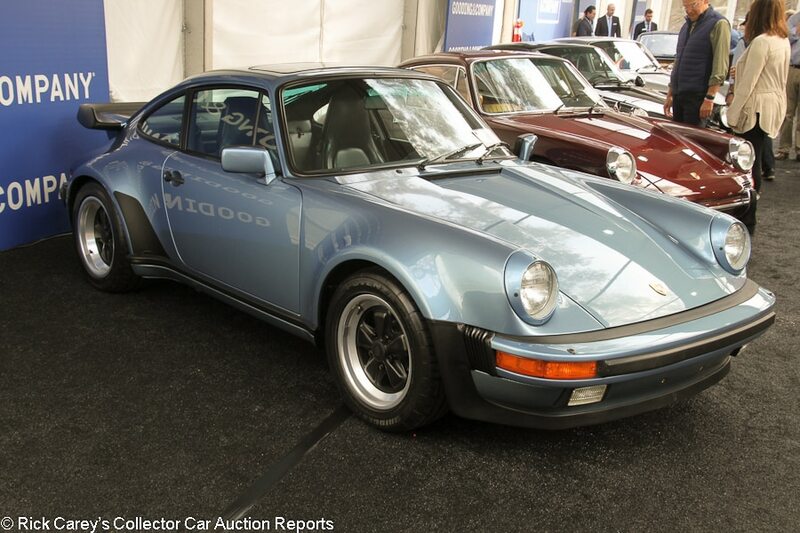 Lot # 53 1986 Porsche 911 Turbo Coupe; S/N WP0JB0930GS050228; Iris Blue Metallic/Navy Blue leather; Estimate $180,000 – $240,000; Unrestored original, 2 condition; No Reserve; Hammered Sold at $150,000 plus commission of 12.00%; Final Price $168,000. – Black Fuchs wheels, Potenza tires, sunroof, power windows, climate control, Blaupunkt cassette stereo. – Showing 6,109 miles that are represented as original and finished in rare, attractive colors. Tiny fisheye in the paint on the front bumper but otherwise this car looks immaculate. The exterior plastic is still bright and the paint is gleaming. The interior looks just about new, the underbody is near spotless and the tires are new. A top notch late 930. – Values for 930s have retreated over the past year and many recent auction results have been pretty weak. This result wasn’t a home run, but the rare colors, pampering from new and very low odometer reading combined for a solid price that the seller should be happy with. Lot # 56 1967 Porsche 911S 2.0 Coupe; S/N 306672S; Engine # 960668; Polo Red/Black leatherette; Estimate $250,000 – $300,000; Unrestored original, 2- condition; With Reserve; Hammered Sold at $200,893 plus commission of 12.00%; Final Price $225,000. – Fuchs wheels, Michelin XZX tires, gold brightwork, woodrim steering wheel, Blaupunkt pushbutton radio, books and tools, Kardex. – First year 911S. With the original owner for 48 years. Pretty remarkable original paint with some chips on the nose and a handful of other chips on the body. Very clean wheels and underbody. Slightly flat driver’s seat and slightly dull gauges, but mostly excellent original interior. Remarkably well preserved and way too good to restore. – It’s also too expensive at this point to restore, given the serious but realistic premium paid for originality in this post-block transaction. 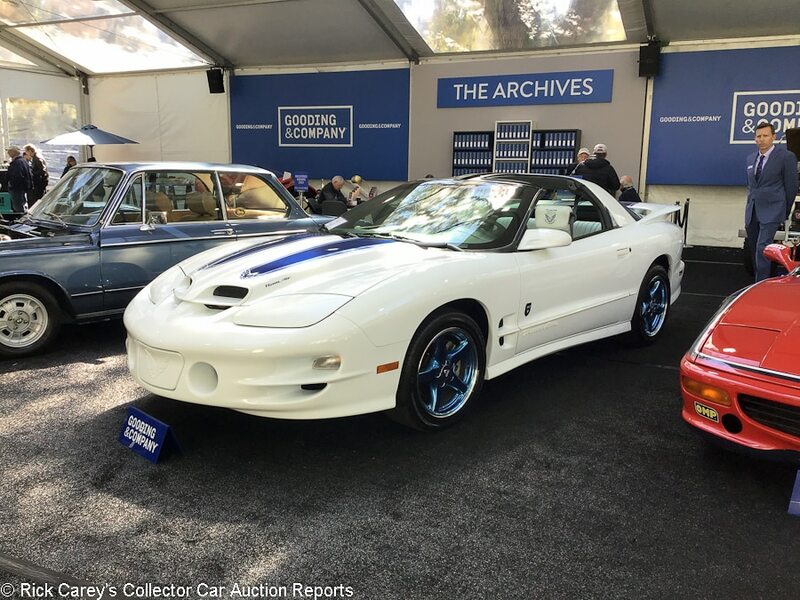 Lot # 59 1999 Pontiac Firebird Trans Am 30th Anniversary Coupe; S/N 2G2FV22G1X2223923; Arctic White, Blue stripes/White leather; Estimate $30,000 – $35,000; Unrestored original, 2 condition; No Reserve; Hammered Sold at $33,000 plus commission of 12.00%; Final Price $36,960. – 346/320hp, 6-speed, air conditioning, Goodyear Eagle tires, Monsoon radio. Includes manuals and window sticker. – Excellent paint. The underbody has no real wear or deterioration. The interior is mostly like new with only a couple minor creases on the driver’s seat. An extremely well preserved 30th Anniversary T/A with just 2,700 miles. – This is an odd venue for a fourth gen Firebird, but the deep pockets at the Omni helped push it to a very strong price, even stronger than the $30,800 it brought at Mecum Indy last year. It’s been detailed since then, but it’s in fundamentally the same condition. 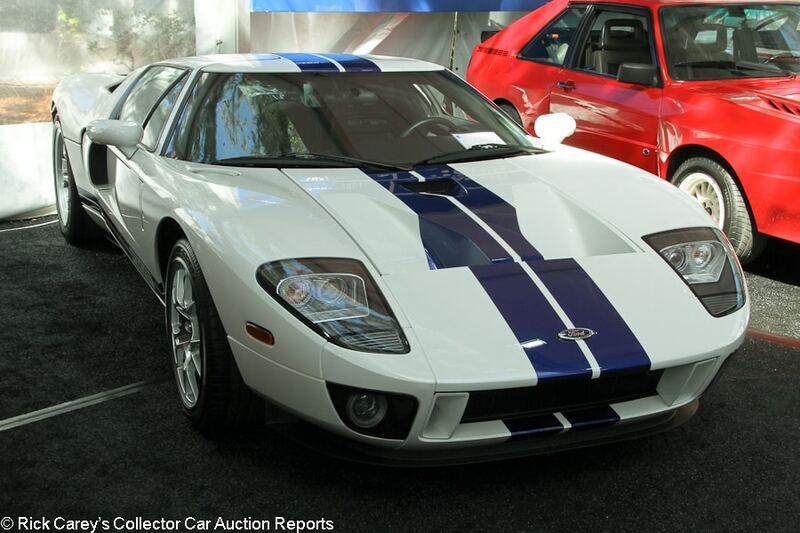 Lot # 61 2005 Ford GT Coupe; S/N 1FAFP90S85Y401421; White, Blue stripes/Black; Estimate $250,000 – $300,000; Unrestored original, 2- condition; With Reserve; Hammered Sold at $215,000 plus commission of 12.00%; Final Price $240,800. – BBS wheels, McIntosh stereo. – One owner and 3,676 miles, which is actually on the high side for a GT. Looks fresh and new like. Almost all of them do, but that odometer reading makes it less desirable. – A low result for a GT that doesn’t really have anything wrong with it other than a few miles. With a GT (or two or three) at pretty much every auction and a new generation now being delivered, potential buyers can pick and choose. Since mileage is about all that distinguishes one Ford GT from another it’s not a surprise that the Gooding bidders heavily discounted this otherwise attractive example. 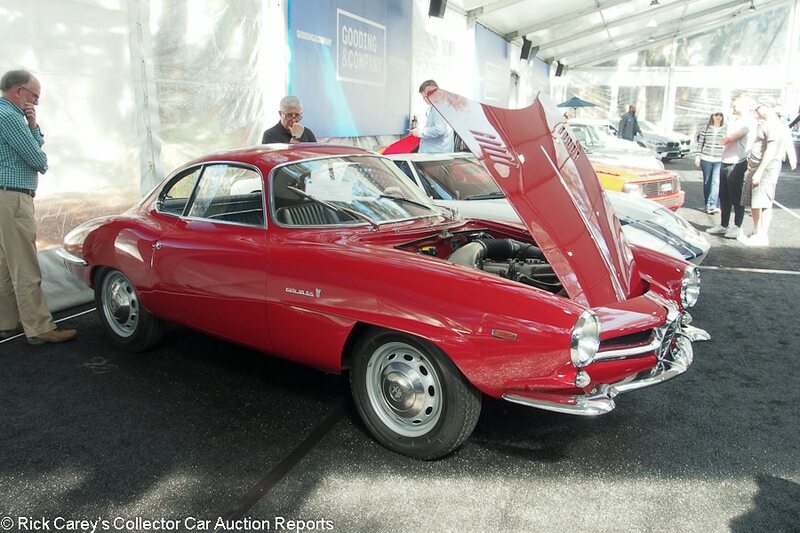 Lot # 62 1964 Alfa Romeo Giulia Sprint Speciale Coupe, Body by Bertone; S/N AR381013; Engine # AR0012100971; Red/Black vinyl; Estimate $110,000 – $130,000; Cosmetic restoration, 3- condition; Reserve; Hammered Sold at $110,000 plus commission of 12.00%; Final Price $123,200. – Bertone radio blank plate, Silver wheels, hubcaps, Vredestein tires. – Good repaint and interior. A few small chips and blisters right behind the hood. Small blister behind the left headlight. Slightly dull bumpers. Light track scratches in the window. Faded gauges and lightly worn steering wheel, but mostly very good interior. Clean orderly engine compartment. Ugly unrestored underbody with old undercoat and paint overspray on old dirt. It makes a good first impression but is disappointing upon a closer look. – Cars like this always beg the question, “What other shortcuts did they take?” Both the estimate range and the bidders appropriately handicapped the dollars while arriving at this reasonable result. Reportedly first sold in the U.S., but the instruments are graduated in metric units, including the speedometer. 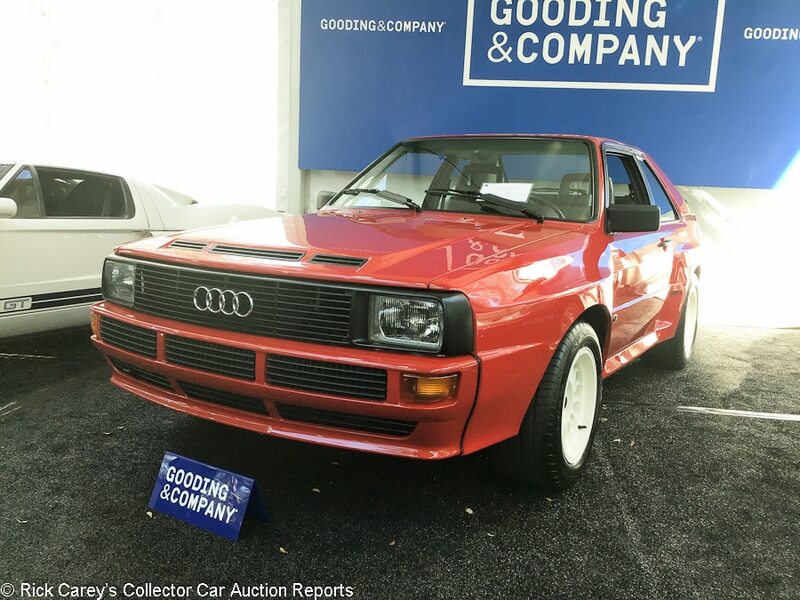 Lot # 63 1984 Audi Quattro Turbo Sport Coupe; S/N WAUZZZ85ZEA905033; Red/Gray vinyl, Dark Gray cloth; Estimate $450,000 – $525,000; Unrestored original, 2- condition; With Reserve; Hammered Sold at $390,000 plus commission of 11.28%; Final Price $434,000. – Air conditioning, radio. Owned new by racer and Porsche dealer Robert Fergus. Includes maintenance records. From the Dobbs Motorsport Collection. – Excellent original paint with only a few minor stone chips on the front bumper. The wheels are very clean. The engine compartment shows use and could use a light detail, but the underbody is very clean and shows minimal use. The interior is extremely clean with the driver’s side seat showing minimal wear. A well preserved example of Audi’s rare, Group B homologation Quattro showing 25,342 miles but looking like a car with far fewer. – Seeing one of these short wheelbase Quattros being driven intensely is a memorable experience which accounts for the generous premium they bring and as demonstrated in this appropriate result. 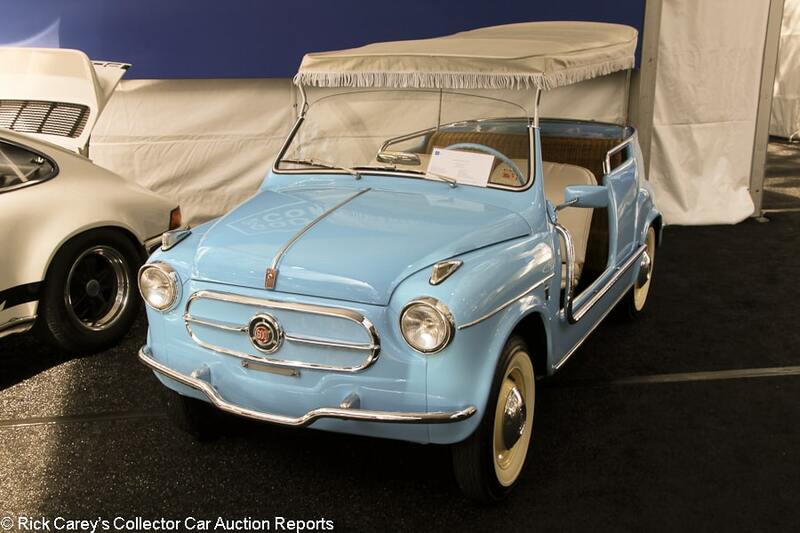 Lot # 64 1959 Fiat 600 Jolly, Body by Ghia; S/N 608059; Light Blue/Wicker; White top; Estimate $70,000 – $90,000; Older restoration, 2- condition; No Reserve; Hammered Sold at $110,000 plus commission of 12.00%; Final Price $123,200. – Hub caps, whitewalls, vinyl seat covers. – Represented as a four-owner car, and restored in 2011. Small scrape on the front bumper and light pitting on the rear chrome. Good but not immaculate older paint and underbody. Lightly faded speedometer, and the wicker seats look sat in. Not ready for the show field, but it’s hard not to love and enjoy a Jolly, which is exactly what someone has done with this one. It’s still great for beach house duty. – The Fiat Jolly continues to charm people out of huge sums of money, and this one’s lightly used condition did nothing to keep it from reaching a six-figure result that is towards the very top of the price range and well over the pre-sale high estimate. 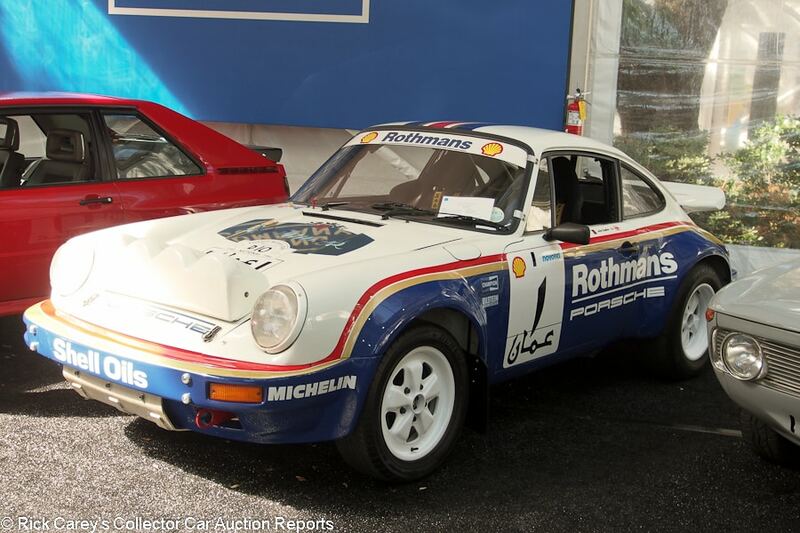 Lot # 65 1984 Porsche 911 SC/RS Coupe; S/N WP0ZZZ91ZES100505; Engine # 63E09022; White, Blue Rothmans/Black cloth; Estimate $500,000 – $700,000; Competition car, original as-raced, 3 condition; Reserve; Hammered Sold at $620,000 plus commission of 10.81%; Final Price $687,000. – Rally lighting and comprehensive rally-configured interior and equipment, white painted Fuchs wheels, road 915-series gearbox (original transaxle included), raised suspension. – Titled on a 1984 Carrera 3.2 RHD road car VIN. Built by David Richards Autosport on a factory tub, documented with a Jurgen Barth letter. The actual tub number is 004 0035. 1984-85 DRA rally history with factory Rothmans engine. Fresher cosmetics but aged and used inside and underneath. – Sold by RM here in Amelia in well-used original condition (“In a Japanese collection since 1989 and still as-raced but in need of re-commissioning and comprehensive attention before being historic rallied.”) It’s had the attention and is eminently usable, a predecessor to the 959 with the 959 look but without the complication, this is a charismatic Porsche that will hold its own on the road, in the desert and at any Porsche show. The result here is modest by 959 standards and the car has a real rally history in period. It sold at RM Amelia in 2003 before its recent work for $48,400, making this a huge home run for the selling Dobbs Motorsport Collection but a sound value nevertheless in today’s market. Lot # 68 1977 Ferrari 308 GTB Vetroresina Berlinetta, Body by Pininfarina-Scaglietti; S/N 19739; Argento Auteil/Black leather; Estimate $160,000 – $180,000; Visually maintained, largely original, 3- condition; No Reserve; Hammered Sold at $98,000 plus commission of 12.00%; Final Price $109,760. – Blaupunkt cassette stereo, Borletti air conditioning, Cromodora alloy wheels, Michelin XWX tires – Poor old clearcoat repaint with too many cracks, chips and scuffs to recount. Sound original upholstery, worn steering wheel rim leather and scraped dashtop edge. peeling driver’s windshield post base. Old undercoat peeling off in the wheelwells. A highly disappointing, neglected old Ferrari. – The bidders were not, for all the right reasons, taken by this neglected old Vetroresina 308 GTB, but their reticence brought the successful bidder an unusually good value in a rare and distinctive Ferrari. It’s a frog, but some well-placed kisses could make it prince-like although had it been presented dusty, dirty and bird poo-covered it might have brought a barn-find premium. Collectors’ motivations are sometimes hard to fathom. 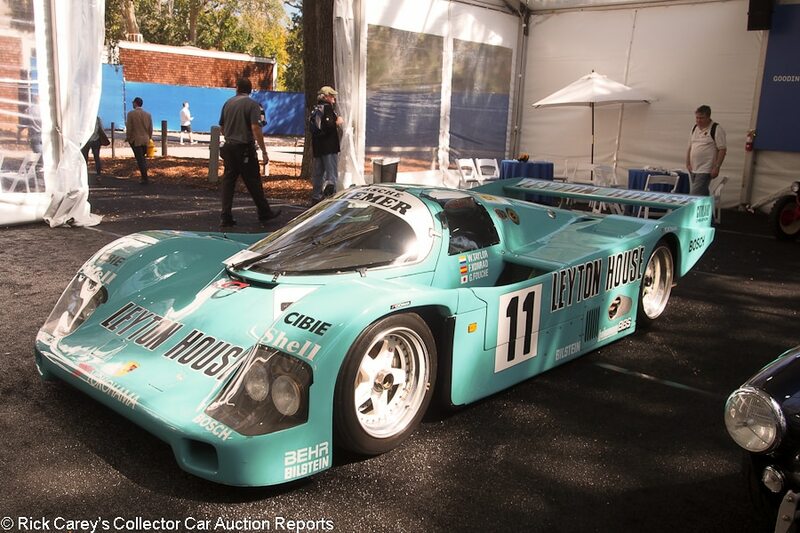 Lot # 69 1987 Porsche-Kremer 962C Endurance racer; S/N CK687; Turquoise, Leyton House/Black cloth; Estimate $1,000,000 – $1,250,000; Competition restoration, 3 condition; Reserve; Hammered Sold at $925,000 plus commission of 10.54%; Final Price $1,022,500. – RHD. Volk Racing modular wheels, Yokohama tires. – Raced at Le Mans 1987-88 by Kremer using Porsche chassis number 962-118, 4th and 8th overall. Dented nose, outie chipped fenders, badly cracked and delaminating rear deck and around the fuel filler. Clean, orderly engine compartment and chassis professionally prepared and presented. Run at the Goodwood Festival in 2008 and dormant since then. Quickly repainted for display and needs professional help as well as extensive mechanical recommissioning after sitting for 11 years. – 962-118 was offered by RM at Amelia in 2003 with a reported high bid of $230,000, but that was this car’s alter ego. The result here for CK6-87 is generous for a car that is aged, neglected and will cost a fortune to make run again. As garage art in its present situation it is even more expensive. 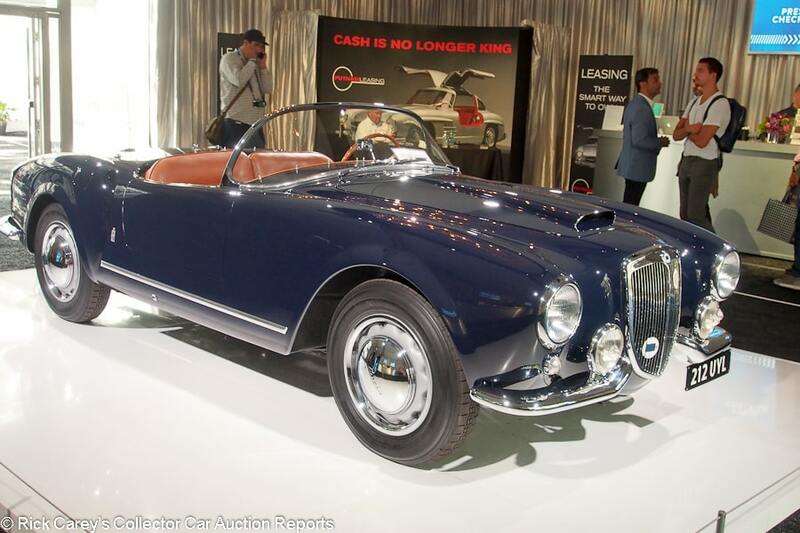 Lot # 71 1955 Lancia Aurelia B24S Spider America, Body by Pinin Farina; S/N B24S1170; Dark Blue/Cognac leather; Dark Blue cloth top; Estimate $1,300,000 – $1,600,000; Recent restoration, 2+ condition; With Reserve; Not sold at Hammer bid of $1,100,000 plus commission of; Final Price $1,100,000. – 2,451/118hp single 2-barrel Weber downdraft carb, Silver wheels, hubcaps, Michelin X tires, woodrim steering wheel, 5-speed floor shift, Marchal driving lights. – Very good recent paint, chrome and interior, a prime example of a rare and special automobile. – Sold by Gooding at Pebble Beach in 2014 for $880,000 before the most recent round of restoration and color change, the consignor cannot be faulted for declining this bid although in a year or so it may not have proven to be a good decision. The B24S Spider America is a really sweet automobile and is eligible for many discriminating events but its Pinin Farina design (and how it fits on the Aurelia chassis) has awkward proportions and has limited appeal. It might have been astute to take this minimal bid if there was money in the marquee. 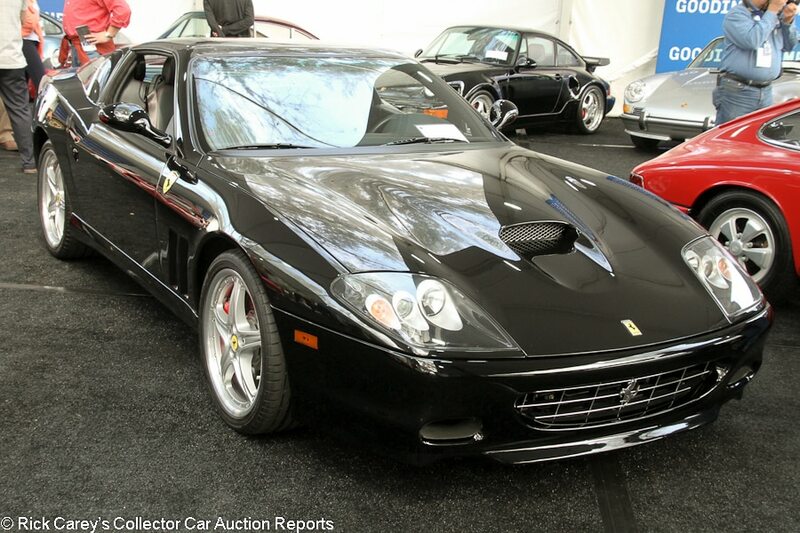 Lot # 72 2005 Ferrari 575M Maranello Coupe, Body by Pininfarina; S/N ZFFBV55A650140877; Nero Daytona/Black leather; Estimate $140,000 – $180,000; Unrestored original, 2 condition; No Reserve; Hammered Sold at $115,000 plus commission of 12.00%; Final Price $128,800. – Red calipers, modular wheels, Pilot Super Sport tires, Handling GTC Package, Daytona-style seats, Becker CD stereo, books, tools, air compressor. – A desirably equipped 575 with 12,000 careful miles. Belt serviced in 2014 at 10,865 miles. It still looks nearly new. – Gooding’s $140,000-$180,000 presale estimate on this very good 575 was perfectly realistic, but the car crossed the block at no reserve and struggled to a modest price, just like the similarly good but more valuable 575 Superamerica that sold 40 lots before it. Lot # 73 1981 Porsche 924 Carrera GTS Clubsport Coupe; S/N WP0ZZZ93ZBS710053; Red/Grey cloth; Estimate $250,000 – $300,000; Competition car, original as-raced, 3 condition; With Reserve; Hammered Sold at $145,000 plus commission of 12.00%; Final Price $162,400. – 1984/270hp, turbocharged, 5-speed, Black Fuchs wheels, Potenza tires, plastic windows, roll cage, Momo steering wheel, 935 seats. – One of 15 924 GTS Clubsports, extensively documented and first owned by racer Bruce Leven. Originally a press car, then raced. Lots of chips and cracks in the paint. Lightly worn interior. Some wear underneath. Some battle scars from racing like it was designed to do, but still more than presentable and among the rarest, most desirable transaxle Porsches of them all. – With 270 horsepower on tap, this is miles ahead of any old standard 924 in terms of performance, and it’s extremely rare, so it is naturally miles ahead in terms of price as well. Then again, it didn’t win any famous races, it’s not a 935 or a 962 and it’s a little bit beat up. This is a realistic result that takes all the pluses and minuses into account. 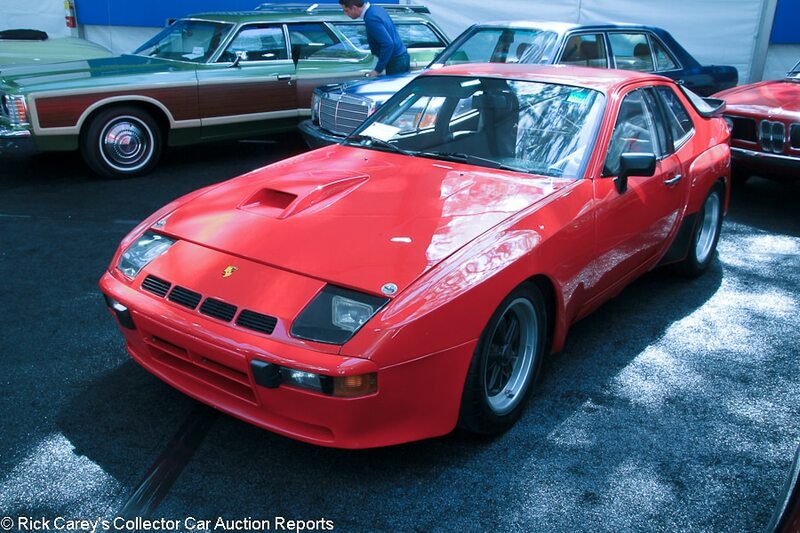 It isn’t a record, as Gooding sold a more storied 924 GTR here two years ago for $220,000. 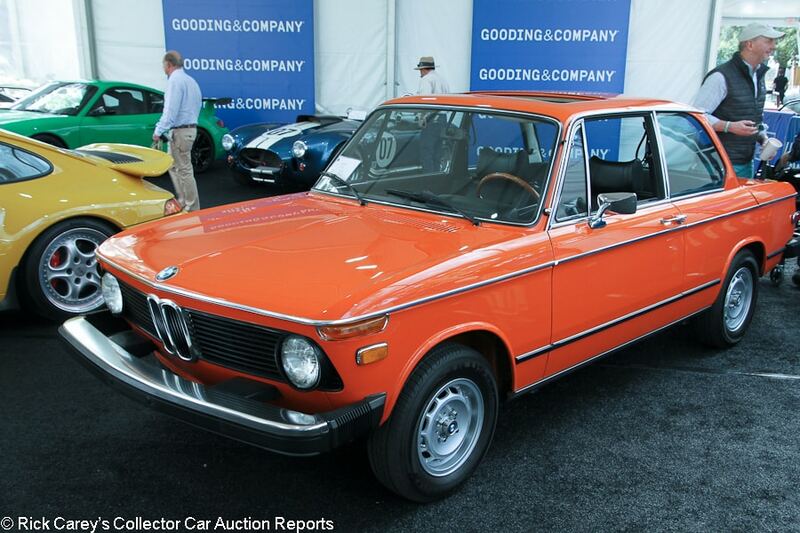 Lot # 77 1974 BMW 2002tii Sedan; S/N 2781157; Engine # 2781157; Inka Orange/Black vinyl; Estimate $40,000 – $50,000; Enthusiast restoration, 2- condition; No Reserve; Hammered Sold at $50,000 plus commission of 12.00%; Final Price $56,000. – Mahle alloy wheels, Kumho tires, 4-speed, sunroof, Nardi woodrim steering wheel, Blaupunkt pushbutton radio. – Small chips and scratches on the bumpers, and the rubber trim doesn’t fit straight. Very good recent paint. Even gaps. Lightly scratched window frames. Very good interior with newer seats, carpets and door panels, but the rest of the interior looks original. Some restoration work underneath but not fully taken apart. A reasonably well but not exquisitely restored example of the desirable tii, and finished in the best color that ever came on these. – Soaring six-figure prices for the 2002 Turbo and a general rise in appreciation for vintage BMWs have seen the sporty fuel-injected 2002 tii come up as a result. Despite this one’s inconsistent presentation and despite being one of three 2002s in the sale (including one more tii and a Turbo), it brought a very strong price. The other tii, a similarly good car with a 5-speed, brought even more at $60,480. 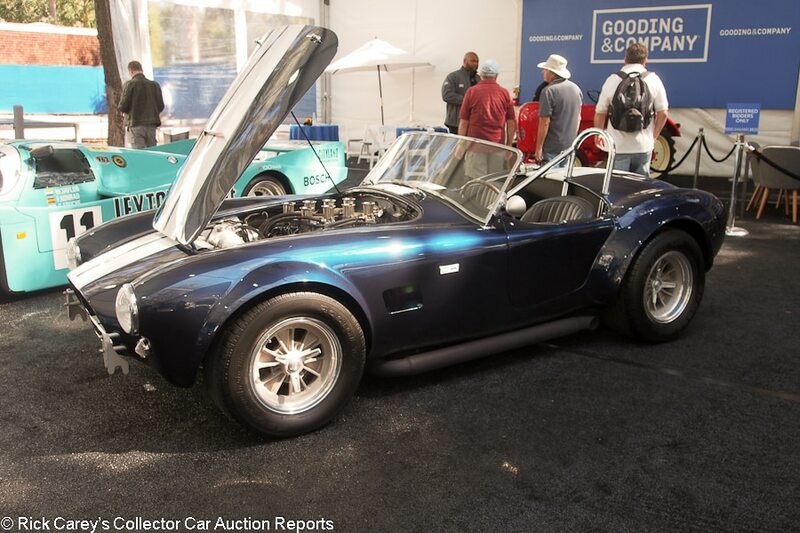 Lot # 81 1964 Shelby Cobra 289 Roadster; S/N CSX2210; Dark Blue, White stripes/Black leather; Estimate $800,000 – $900,000; Older restoration, 3+ condition; No Reserve; Hammered Sold at $645,000 plus commission of 10.78%; Final Price $714,500. – 289/380hp 4-Weber XE engine, centerlock 5-spoke alloy wheels, driver’s paperclip chrome rollbar, quick jack pickups, modified with cutback door flared fender FIA-style bodywork, matte black side exhausts. – Restored in the mid-Eighties in this modified style. Scraped right rear wheel rim, stone chipped rear fenders. There is some sheet metal damage on the passenger’s side where the bolt for the sway bar link hit the trunk pan, causing a dent and separation at a pan seam. Orderly engine compartment. Well done but not exceptional, especially the engine and road grimy chassis. – This is a handsome Cobra cafe racer with no racing history but lots of racing panache. It is a neat thing, but it is a “thing”, not an historic artifact and the Gooding Amelia bidders seriously handicapped its many boy-racer features in this price. The result is reasonable, but maybe not reasonable enough for a much-modified 289 Cobra with no period competition history. 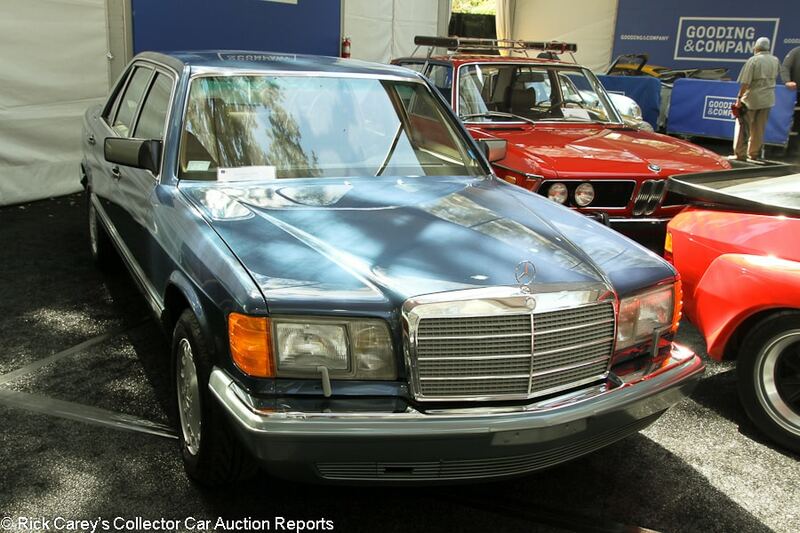 Lot # 82 1986 Mercedes-Benz 420SEL Sedan; S/N WDBCA35D3GA218427; Blue, Grey/Palomino leather; Estimate $40,000 – $50,000; Unrestored original, 2- condition; No Reserve; Hammered Sold at $26,000 plus commission of 12.00%; Final Price $29,120. – Alloy wheels, Michelin tires, Becker Grand Prix radio, power windows, sunroof, air conditioning, books, tools, accessories. – Represented as just 18,609 believable miles and with the first owner until last year. A few tiny, tiny chips and fisheyes on the hood and a small scratch on the left rear door but the original paint is mostly fantastic. The interior is nearly like new. Clearly pampered, lightly driven and for the most part not driven at all. Absolutely a collector-grade example. – While it was a Mercedes flagship in its day, the W126 doesn’t command huge prices for the most part these days. But the cream rises to the top and it would be hard to find a better, lower-mile example than this car. 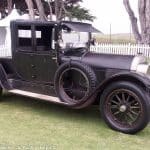 The bidders recognized what a rare opportunity this car was, and showed it with their bids which resulted in this realistic price despite the overly optimistic pre-sale estimate range. 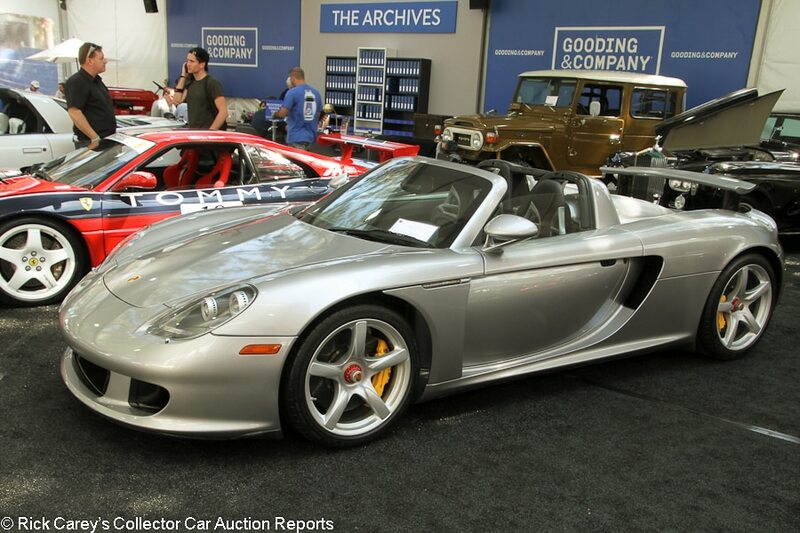 Lot # 83 2004 Porsche Carrera GT Coupe; S/N WP0CA29894L001182; GT Silver/Black leather; Estimate $650,000 – $750,000; Unrestored original, 2 condition; With Reserve; Hammered Sold at $620,000 plus commission of 10.81%; Final Price $687,000. – Yellow calipers, Pilot Super Sport tires, air conditioning, Bose stereo, matching luggage. – Just 4,400 miles and like new, like most of these are. Fully serviced last year. – A fairly modest result given that several Carrera GTs have brought over 700 grand recently, but there were 31 Porsches on offer at this sale alone and this one just flew under the radar a bit since there wasn’t really anything special about it other than that it’s a Carrera GT. As with the Ford GTs, a few miles that would be negligible on most other cars can make a significant difference in Carrera GT values. The field of low miles late model super/hyper cars is getting crowded. Lot # 84 1995 Ferrari F355 Challenge Berlinetta; S/N ZFFPR41A2S0104321; Red, Blue stripe/Red cloth; Estimate $150,000 – $200,000; Competition car, original as-raced, 3+ condition; No Reserve; Hammered Sold at $137,500 plus commission of 12.00%; Final Price $154,000. – Assembly # 21282. Speedline mag wheels, OMP carbon fiber seats, roll cage, wing. – Good repaint for show purposes but the rest is aged, clean and as-raced. Engine-out serviced in 2015. Originally owned and raced by Lawrence Stroll with appropriate Tommy Hilfiger livery. – This is a magnanimous result for an old F355 Challenge car. 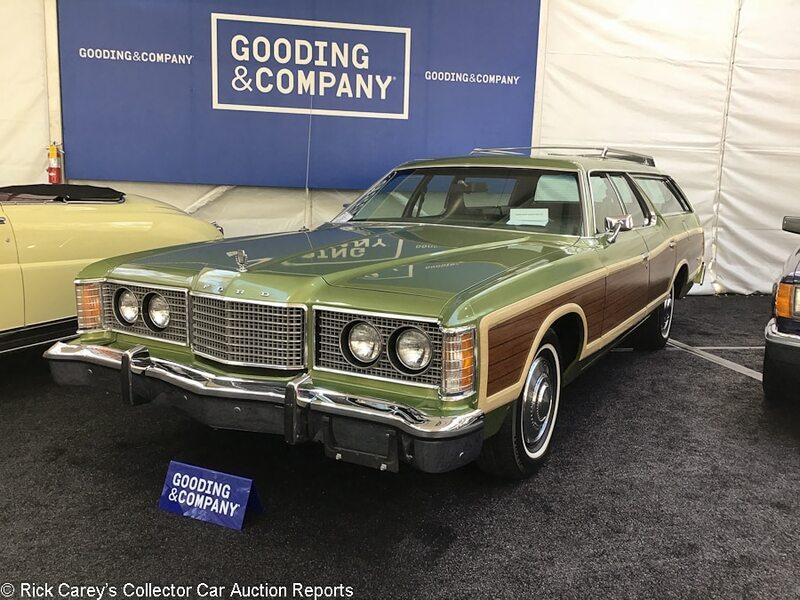 Lot # 85 1974 Ford LTD Country Squire Station Wagon; S/N 4J76S162122; Green Glow, Woodgrain/Green vinyl; Estimate $30,000 – $40,000; Unrestored original, 2- condition; No Reserve; Hammered Sold at $41,000 plus commission of 12.00%; Final Price $45,920. – 400/170hp, automatic, air conditioning, luggage rack, rear window defogger, AM radio, power locks. – Kept by a Washington Ford dealer until 2015. The original paint is very good with little deterioration and a few minor cracks on the driver’s side roof line near the cargo door and a few imperfections in the nose. The front bumper has very minor pitting. The engine compartment is extremely clean and the engine has few signs of use. The underbody is very clean, and only the exposed metal components have minor oxidation. The interior is unused and looks like new. An amazingly well preserved family wagon. – Sometimes it pays to bring a car to an auction where it is completely unexpected and out of character, like here at Gooding where the docket looked like a Porsche dealer’s used car lot. This is an extraordinary result. Lot # 86 1958 Porsche 356A Speedster, Body by Reutter; S/N 83828; Engine # 67278; Meissen Blue/Red; Black top; Estimate $300,000 – $400,000; Modified restoration, 3+ condition; With Reserve; Not sold at Hammer bid of $172,500 plus commission of; Final Price $172,500. – Later 1720cc/75hp engine, hub caps, Vredestein tires, gold brightwork, owner’s manual, tools, Kardex. – Four-owner late Speedster. The rubber in the front bumper is a little wavy. There are some flecks in the paint on the hood and there are detail scratches throughout. There is an odd rub through on the right front and the body side trim doesn’t fit flush. Very clean underneath, and the interior is very good. Great colors and it’s gorgeous from a short distance, but with a number of flaws and the wrong engine, this isn’t a top notch car. 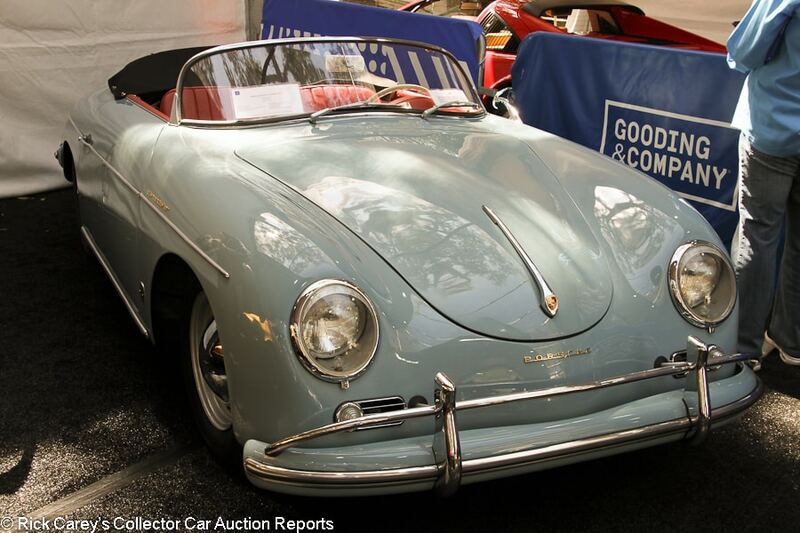 – With many quality Porsches from which to choose the bidders here chose not to pursue this compromised presentation and much-modified 356A Speedster. The result here probably isn’t much of an indicator of this car’s value as much as it is the effect of limited interest. 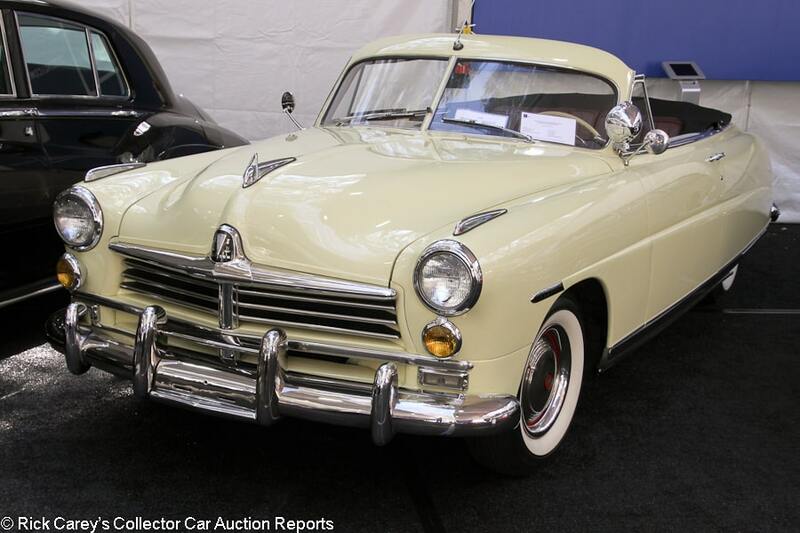 Lot # 87 1949 Hudson Commodore Convertible Brougham; S/N 49458715; Cornish Cream/Burgundy; Black top; Estimate $100,000 – $150,000; Cosmetic restoration, 3+ condition; No Reserve; Hammered Sold at $46,000 plus commission of 12.00%; Final Price $51,520. – Hub caps and trim rings, whitewalls, dual mirrors, spotlight, column shift 3-speed, factory radio, power windows, dash clock, amber fog lights. – Older chrome that has lost some of its gleam. Light pitting on most of the brightwork. Several touch ups at the back of the hood and lots of light scratches on the passenger’s door. Cracked steering wheel rim, but the rest of the interior is very good. Tidy with light restoration work underneath and older undercoating, but never fully taken apart and rebuilt. Represented as a recent restoration but doesn’t look like it. It’s a classic 20-footer, with great colors and nifty step-down Hudson styling doing the car a lot of favors, but there are plenty of small things to nitpick. 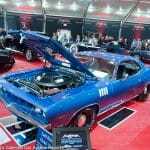 – This car brought a little over 30 grand at Mecum Dallas in 2012, then sold for $62,060 at Mecum Indy the following year. It’s been cleaned up a bit since then but is in fundamentally the same condition, and the price here in Amelia is realistic given the car’s several issues. 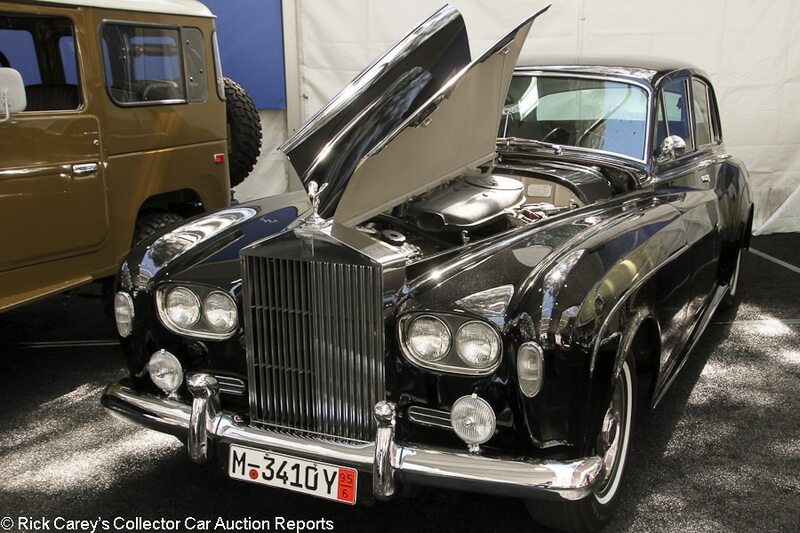 Lot # 88 1964 Rolls-Royce Silver Cloud III 4-Dr. Sedan; S/N LSEV175; Engine # SV87E; Mason’s Black/Black leather; Estimate $100,000 – $120,000; Cosmetic restoration, 3+ condition; No Reserve; Hammered Sold at $42,500 plus commission of 12.00%; Final Price $47,600. – Wheel covers, narrow whitewalls, power windows, air conditioning, original pushbutton radio. – Desirable US delivery Cloud III. The engine bay is unrestored and a little grimy but visibly maintained. Some dirt and oxidation on the underbody but no major rust. Good older chrome. Decent older paint with some blisters at the bottom of the left rear window, plus several chips and cracks around the door edges. Very good newer leather, and the wood is in very good shape as well. Desirable configuration and colors, but the older and superficially restored condition leaves quite a bit to be desired even if it isn’t a bad car. – The Cloud IIIs are the most desirable of the Silver Cloud series since they were the last and most well-equipped, and although prices have taken a step back over the past couple of years this is a seriously low price for just about any serviceable example, let alone a solid driver like this. 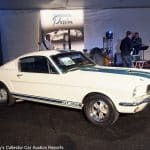 After hammering not sold at an $80,000 high bid at Mecum Monterey in 2009, it resurfaced for auction at Gooding’s Pebble Beach sale in 2016, when it sold for $104,500. It’s not less than half the car it was three years ago, so less than half the price makes it arguably one of the best deals of the week. 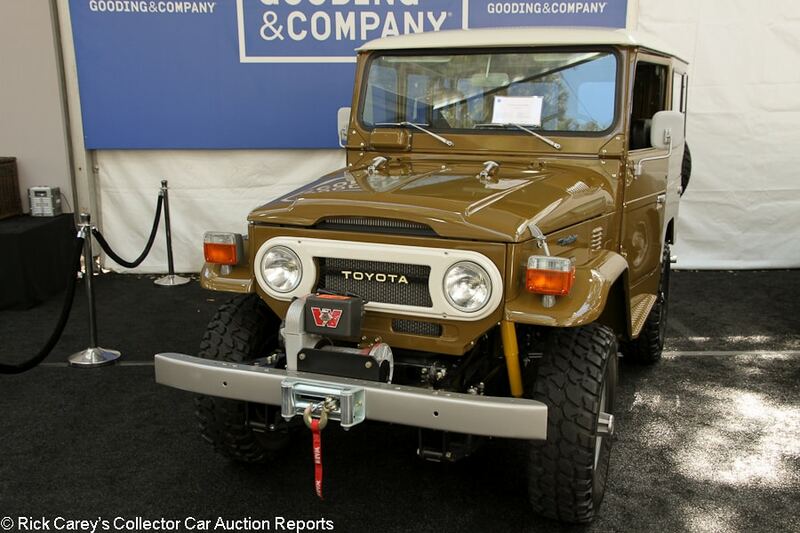 Lot # 89 1977 Toyota Land Cruiser FJ40V Hardtop 4×4; S/N FJ40246810; Olive Green, White roof/Black; Estimate $60,000 – $80,000; Recent restoration, 2- condition; No Reserve; Hammered Sold at $60,000 plus commission of 12.00%; Final Price $67,200. – Warn winch, rear-mounted spare. – Desirable US market FJ40 fully restored last year. The frame is immaculate and fresh. Fresh paint, but there are some particles in it here and there, as well as some light orange peel in spots. Excellent interior, fully restored down to new bolts on the seat frames. Not the world’s best FJ, but needs nothing major and shows just 898 presumably test miles. – People aren’t paying six figures for overrestored FJs like they were a few years ago, and as a result not as many people are over restoring them. This is a mostly phenomenal example and it fairly brought somewhere near the top of the price spectrum, but the bidders at the Omni appropriately discounted it for the imperfect paint. 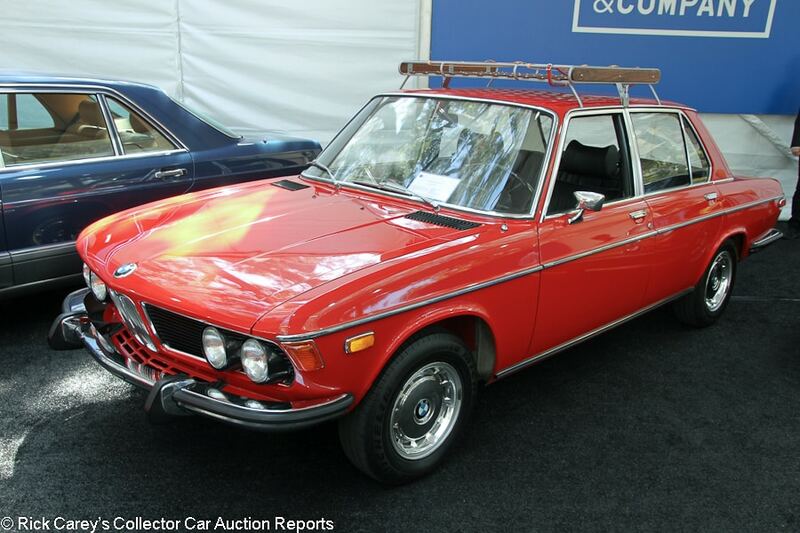 Lot # 91 1973 BMW Bavaria Sedan; S/N 3105537; Verona Red/Black vinyl; Estimate $35,000 – $45,000; Unrestored original, 2- condition; No Reserve; Hammered Sold at $26,000 plus commission of 12.00%; Final Price $29,120. – 4-speed, wheel covers, Michelin tires, roof rack, wood shift knob, pushbutton radio, VDO dash clock, original books, tools and spare. – Light wear on the BMW badge. Some light detail scratches, a handful of chips and some slight rub through on the right front, plus some blistering on the left wheel arch, but that’s all forgivable on otherwise remarkably well kept original paint. Light scratches and a small dent on the windshield frame. Clean bumpers and plastic. Fantastic seats and carpets. A few tiny cracks in the dash but the steering wheel, shift knob and gauges all look fantastic. Showing just 17,795 believable miles. It’s unusual to see a Bavaria in any condition these days, so to see one so babied and original is really special. A great classic BMW with room for your kids or friends. – Despite being the last car of the sale, this is a monumental price for a Bavaria, but then again most of them have long since rusted away or been used up, so it would be just about impossible to find another original this good. And the bidders were more than willing to pay for that distinction. Perhaps not intended but as far as it goes “the first will be last and the last will be first” ..two red Bimmers bookending the report 😉 The Bavaria and 2002 were there during my younger days (1970s) back in Cali. How it all changed. I last saw a Bavaria Dallas maybe a year ago. Still intact and running with its auto transmission. An acquaintance selling cars on his note lot dealt in M3s during the middle 90s. They were merely high-class beaters then. Lot #88 WAS really nice. Thanks for the report.